Largest Segment – Is it the best way to gauge the closeness of relationship? In my earlier blog posts I have mentioned how significant the largest segment size is when determining a true 2nd to 3rd cousin relationship. Polynesians can have a total shared amount that can easily exceed 100cM. These totals tend to over-estimate the predicted relationships. 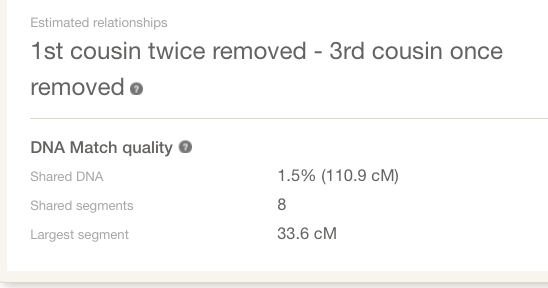 From the ISOGG Wiki’s page, you can see that the average for 2nd cousins once removed (2C1R) is 106cM while 2nd cousins are averaging around 212.50cM. So we tend to get a lot of these 2nd – 3rd cousin matches, depending on the company you tested with. This is why the largest segment size has become important. 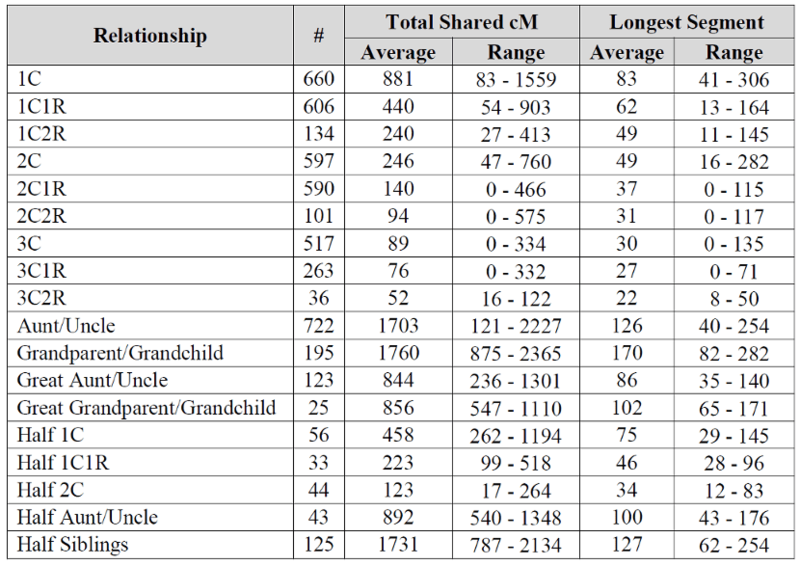 Blaine Bettinger has a post entitled The Shared cM Project – Longest Shared Segment where people had submitted their longest segment size based on their known relationships. 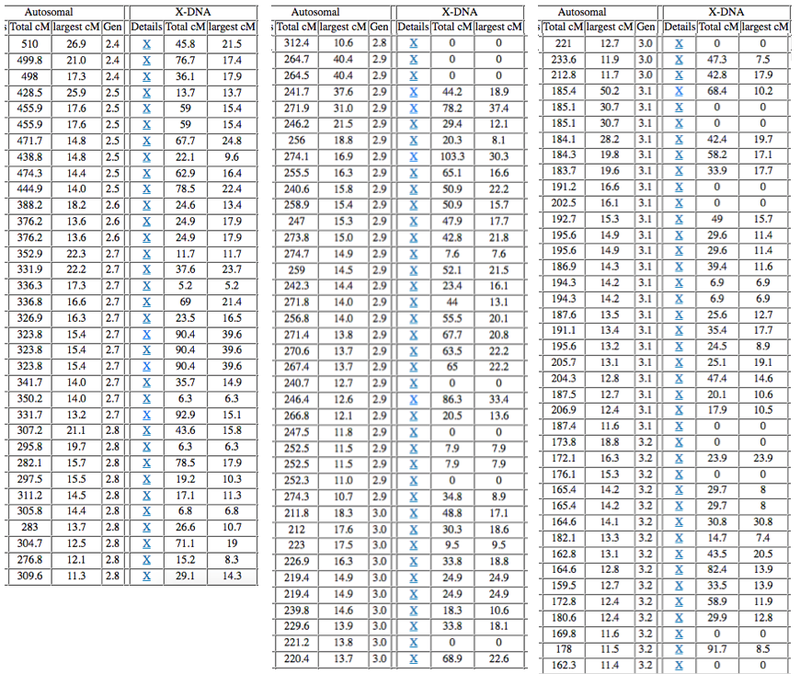 You can compare 2nd and 3rd cousins there and see what the average is for the longest segment size for specific relationships. A quick look at the type of numbers just by looking at my own ONE TO MANY from GEDmatch.com. My cousin Allen who is a 2C1R to me (his maternal grandmother & my mother are 1st cousins) has a large segment of 35.9cM. You can see more comparisons of the largest segment for 2nd to 3rd cousins from Blaine’s Shared cM Project but I also have been keeping my own numbers from my known relatives. Only one of those 2nd cousins shared a large segment of 21.8cM, pretty small, and then it gets even lower as you go more distant. But normally 2nd cousins will share a rather large segment, which is why more than 20cM has always been advocated and also among the Ashkenazi Jewish community. In fact, I thought they used 25cM, but I could be wrong. I even mentioned 30cM would be good. But is it a requirement? Absolutely not. However, if you cannot find a connection, or the same geographical origin i.e. New Zealand or Hawaii, then that would be a strong indicator that you are not as closely related as it was predicted. I have been noticing how I do have a few Hawaiians whose largest segment is more than 30cM but have not been able to find a connection. I also notice that these matches will not have the same geographical origins as I do. So could it be that these large segments remain in our population for many generations? Here’s an example of how it actually has remained for centuries by comparing my Hawaiian mother and a Maori. Taking my mother’s ONE TO MANY matches, I sorted them by the largest segment size. I indicated the known relatives in blue and the unknown in red. My mother has a Hawaiian match as 44.6cM for the largest segment. I still have not been able to find a connection, although one of that match’s branch goes back to the area of a few of my ancestors. But even for us, that was more than 3 generations ago from my mother. Another at 39.9cM, not sure if that person is a Hawaiian or Maori. And there is a Maori match with the largest segment of 25.9cM. At FTDNA, there is a Maori match whose largest segment is 23cM. Here is the largest segment sized match with a couple of Hawaiians from MyHeritage. 37.2cM and 33.6cM. They have pretty good trees but their ancestry goes back to totally different islands from my own ancestors. And I saw in their trees the origins of the different islands is further back while the more recent ones were born in Honolulu where some of my more recent ancestors were born. I did trace many of my ancestors’ descendants who remained in Honolulu but none are those connect to these matches. Here is a Maori match from MyHeritage. Notice that the largest segment is 34.2cM. The highest I’ve seen with a Maori. How can a large segment last that long after many centuries? And while the focus here is utilizing the largest segment to get a more accurately find a true 2nd to 3rd cousin match, we know how in one generation a large segment can quickly be reduced. Comparing with the largest segment that my mother shares with her 1/2 3C. This is how they connect. I outlined in yellow all testees in this particular comparison. 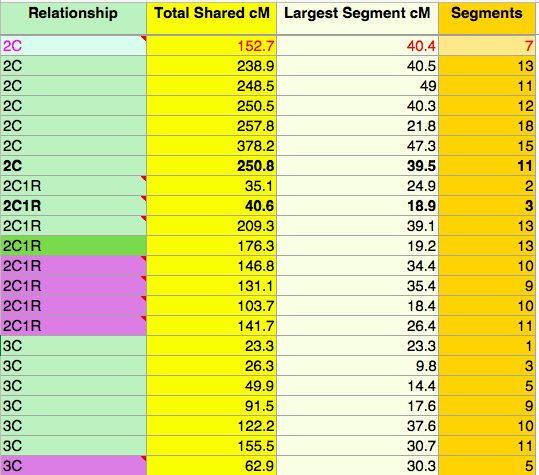 The largest segment that my mother & her 1/2 3C share is 49.6cM (FTDNA indicated 52cM) according to GEDmatch. But that particular segment was not inherited entirely by my mother’s sister and seemed to have been broken up thanks to recombination and turned into a 10.7cM and a 25.1cM segment. My mother’s deceased brother seemed to have received that same segment or maybe even slightly larger. And while he is not alive to test, his son did, and he shares 50.2cM with this 1/2 3C of our parents, or our 1/2 3C1R. This is what the comparisons look like. My younger brother got nearly the entire segment as my mother got it but I got a very small portion of it, just 14.3cM. That’s a huge difference from 49cM. Had my mother nor my younger brother got tested, I would not have been able to find this good match and would have concentrated on matches with large segments more than 20cM or even 30cM. My older brother got DNA tested however he does not share any of this same matching segment. In fact, he shares 0cM on this particular chromosome. This 1/2 3C was key in finding my mother’s biological parents. At the time I did not know how we were related but I did concentrate on this match because of the large segment size. So how do we really filter all of these matches? By solely concentrating on the largest segment? You should definitely not spend too much time on large segments that are less than 20cM and whose shared total is way over 200cM. With those particular matches, if you compare trees and notice no common geographic area, that would be a big indicator that it is a distant match. Remember that with a 2nd cousin you would share a pair of great-grandparents. With a 3rd cousin you would share a pair of 2x great-grandparents. By that generation or even a generation further back or two if you find that you do not share the same geographic location, then the match is a distant match. The same applies for large segments greater than 30cM. If no common geographic location, then it is probably a distant match. Back in April, FamilyTreeDNA (FTDNA) finally updated their myOrigins. This was initially set to roll out shortly after November 2015’s 11th Annual International Conference on Genetic Genealogy held in Houston, Texas. 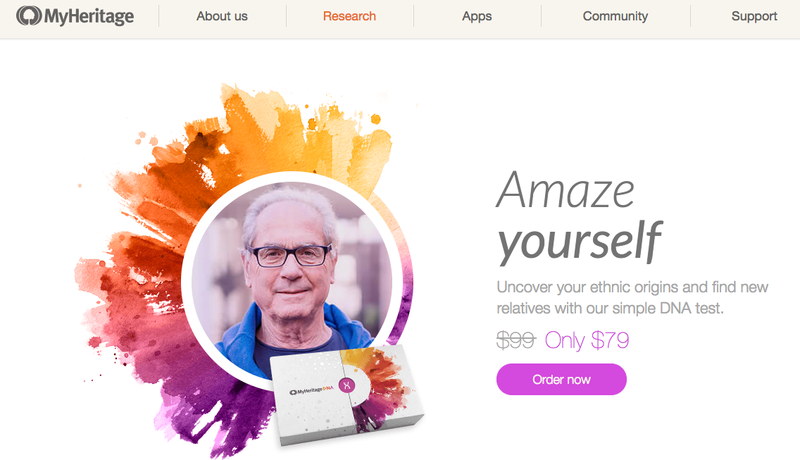 FTDNA started off with Population Finder, which was replaced by myOrigins in May of 2014. With Population Finder, they had an Oceania (Papuan, Melanesian) category. When they switched to myOrigins, they removed the Oceania category. Since Polynesians are about 75% Southeast Asian and 25% Melanesian (Oceania), Polynesians would show up as just Southeast Asian. They increased their population clusters so now they have a total of 24. I believe prior to this newer version there were about 18 of them. While a lot of people have reported how “off” these results are, focusing on just the Polynesian genome, I notice that there is a consistency to have about 3% – 9% Northeast Asian along with the predominantly nearly 75% Southeast Asian. These are the different versions. FTDNA seems to be ever increasing the amount of European that I have for whatever reason. I usually range between 8% – 12% at various DNA companies. 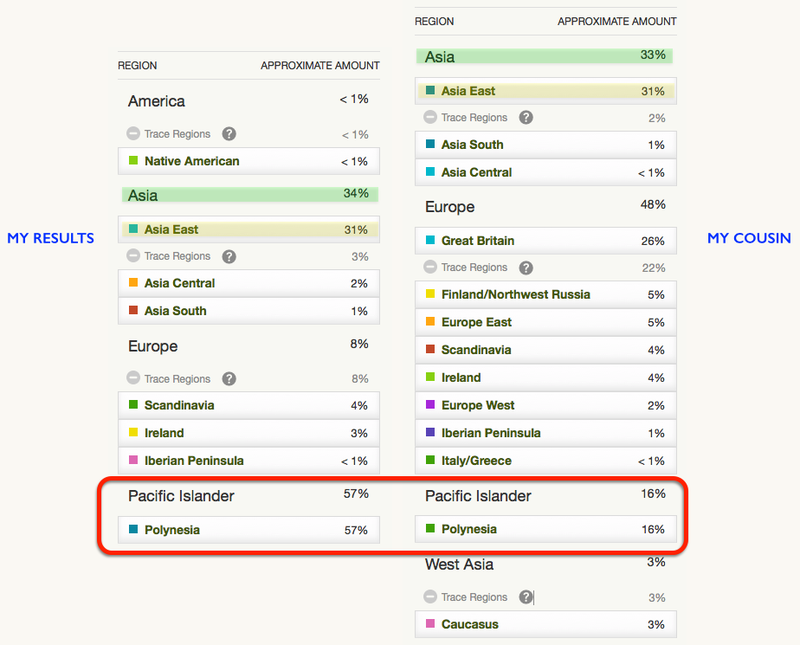 Below is a breakdown of what other Polynesians have been getting with the new version of myOrigins. Percentage breakdown by the various East Asian and Oceanian categories. For now it seems that the new version of myOrigins are giving a lot of people many trace regions. While I did not include them in the image above, I have been seeing this for eastern Polynesians so far. Maybe in the future there will be an update that could refine these trace regions so that it appears less for everyone. As of May 30, 2017, MyHeritage finally released their Ethnicity Estimate (beta) to those who uploaded their raw data. So far this service is still free. Not sure if they will discontinue that service. Currently their tests are at a reduced price of $79. 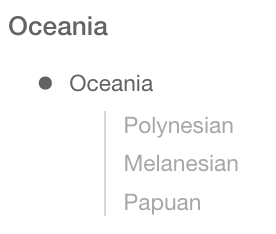 Not only does MyHeritage (MH) have an Oceanian category but they included Polynesian along with Melanesian and Papuan. Last year and probably the year before that, they reached out to people who had a tree at MH whose 4 grandparents were listed in a given geographic area confirming ties to that particular place or country. And while they seem to have obtained more than Ancestry’s 18 Polynesian samples, they did not take into consideration that these people may be admixed. A lot of admixed Polynesians who did test with MH are reporting to have lost a lot of their European while simultaneously having an increased percentage of Polynesian. There seems to be about 10% difference. Here are my mother, my maternal aunt and my own results. My mother and her sister are 85% Hawaiian while 15% is of European background. My mother gets about 17% European at the varying DNA testing companies. Several Polynesians have shared their Ancestry results with me. Comparing it to MH it seems that the numerous samples that they used for the Polynesian category included some admixed Polynesians of European heritage. I have been hearing the same situation for those with admixed Native American background reporting 20% to 30% more Native American while reducing the amount of European. What is interesting about MH is that they did have other populations not covered by the other testing companies. They separated the Melanesian and Papuan, commonly grouped together and labeled as “Oceanian” by other companies or at GEDmatch, and provided a separate Polynesian category. They did something similar for the Asia group. MH has specific groups within the Southeast Asia area, such as Filipino, Cambodian, Vietnamese, Thai, Malaysian and Indonesian. While the thinking is that if you come from that particular background which they tested, you should score perfectly with that group. This may not apply for some either due to the limited number of samples and/or where they got their samples from, such as taking samples from one specific area. I have only seen a few Filipinos’ results where they score 100% Filipino/Indonesian/Malaysian. A couple of Chinese people received majority Chinese and Vietnamese and a smaller percentage of Filipino/Indonesian/Malaysian. 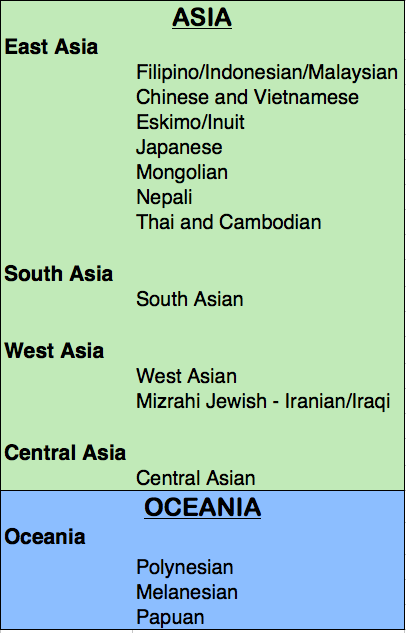 My guess is that this breakdown of the various Southeast Asian groups helps separate Polynesians (and Micronesians) who also have some Southeast Asian background. At Ancestry, Chinese people were reporting about 10% Polynesia, Vietnamese as high as 15% and Filipinos around 32%. Ancestry has no Southeast Asian category, so those of Southeast Asian background will get some of the East Asian, or what Ancestry has as “Asia East” along with a small percentage of Polynesia. New 5th Cousin connection helps map out chromosome! While there is one branch where I find a lot of relatives on my great-grandmother Rose Holbron’s side, I am slowly finding distant connections on my great-grandfather Frank Kanae’s side. Frank Kanae was Rose Holbron’s husband. Earlier this week I received an email from a woman named Raychelle who saw me and my numerous kits of family members that I manage on GEDmatch.com as a match to her. I began the normal response, almost ready to dismiss her since many of these matches appear to be close when in reality we are usually distant, and for others, much more distant. And from what I could see, it wasn’t such a huge amount. At GEDmatch, Raychelle and my mother shares 62.9cM total, with a large segment of 10.7cM. So at least a 4th cousin level. After I told her that she could find me on Ancestry (since she uploaded to GEDmatch via Ancestry) and look at my HOLBRON family tree, she found out that we have the LEWIS connection. She is a 5th cousin to my mother, and a 5th cousin once removed (5C1R) to me. I come from Isaac Lewis who was known as Isaac Lewis Kanae or Isaac Kanae Lewis, and also known by the Hawaiianized version – Aikake Lui. While Raychelle comes from John George Lewis, and his Hawaiianized name was Keo Lui. My assumption is that Keo was short for Keoki (George). Keo could also be short for Keoni (John) and then there was the catholic version – Ioane for John. But what was interesting is that she had this genealogy and I had updated mine from this to reflect what a couple of people have been researching. According to the information that has been circulating at various sites on the internet, Isaac’s father – Captain Isaiah Lewis was the son of Captain Ezra Lewis. And John G. Lewis was the son of Captain John Lewis, who was Captain Ezra Lewis’ son but through a different wife. I listed them as spouse #1 and spouse #2 because different sites and people will switch the spouses showing Isaac as the son of one spouse, and another will show Isaac as the son of the other spouse, and vice versa for John G. Lewis. So the question is, were Isaac and John full brothers, or (maternal) half-brothers? And if they were (maternal) half-brothers, were their fathers paternal half-brothers? While all of this information going back that far is based solely on people creating these trees without further documentation, for now I am only going by what was documented. The trees habitually say that Polly was known as Sarah Pauline “Polly” Holmes. While I can understand that Polly could be a diminutive for Paula and Mary, I’m not so sure that these are the same person, especially since a lot of the information lists this Sarah Pauline “Polly” Holmes having been born in Massachusetts and died there, and that her husband Captain Isaac Lewis from Massachusetts too. What we know for a fact according to testimonies from people who lived during the time of Polly Holmes and her father Oliver Holmes. 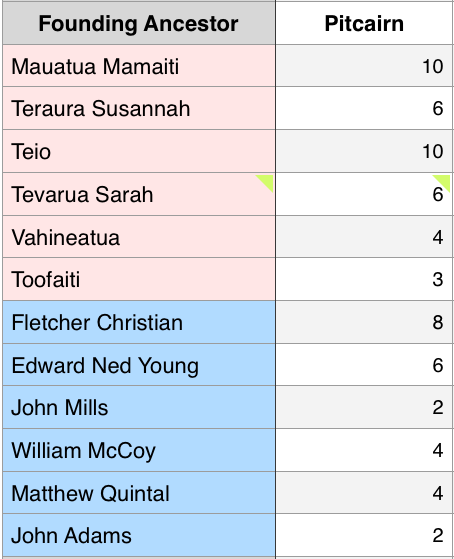 I am still in the process of confirming and documenting all of these ancestors, so for now I am considering Raychelle and I 5C1R, and that her 3x great-grandfather John George Lewis (Keo Lui) and my 4x great-grandfather Isaac Lewis Kanae (Aikake Lui) were full-brothers. I compared Raychelle to all of the relatives to see which segments we all had in common. Any common segments or segments that multiple relatives share would indicate that segment was inherited from a common ancestor. In this case, Polly Holmes and her husband Isaiah Lewis. And while autosomal DNA inherited from our common ancestor can remain in our genome for about 5 – 6 generations, there are some cases where it can span several generations and for some as we have seen, in larger segments. These larger segments tend to be passed on within generations entirely intact and having not recombined. With endogamy, that may confuse things as it isn’t guaranteed that the shared segment came from that same common ancestor. Especially for Polynesians where we share many small segments. And these multiple segments may not be in common with other relatives, or rather these segments may not overlap as what I am about to demonstrate. So when looking to map out these segments, and at the 4x great-grandparent level, if the segments are really small, that may be suspect to being segments randomly inherited. It may or may not be from the common ancestor, or may come from the same common ancestor multiple times through their different descendants. I first compared my brother Kaimi and Raychelle and looked for the chromosomes that should match my mom. Kaimi and I have different fathers, so I decided to use his to compare because his father is also Hawaiian. I use Kaimi’s unphased and phased data to be sure that if there are extra segments that does not match our mother, then the presumption is that the segment came from Kaimi’s father. These were the results. You can easily see how with the phased data the size of the segment is somewhat smaller if it doesn’t remain the same or disappear altogether. The real work comes in when I compare Raychelle to my mom’s brother’s son Chris, her half-brother’s daughter Lena and her maternal half-sister Aunty Stella. The detailed specification of their relationship is to help you understand how they are related and know what is to be expected as far as sharing DNA with different relationships go. What I did first was compare Raychelle to all of those family members mentioned and then see which of those matching segments actually matches up with what my mother matches. Here’s a diagram of how we are related and descend from Isaiah Lewis and Polly Holmes. I’ll start first with Chris, the son of my mother’s brother Joseph. While there were other segments that Raychelle shared with Chris, I am only comparing overlapping segments that are shared with my mom. There are 3 chromosomes where they share overlapping segments. Ch 6, 7 and 20. With Aunty Stella, there were segments on different chromosomes, sometimes on the same chromosome but in different parts of the chromosome that did not overlap. Only one overlapping segment which is on ch 7. Then with Lena, the daughter of my mom’s half-brother George. Lena also shared different segments and different chromosomes with Raychelle that my mom does not have, except for ch 7. So what is consistent with all of them is that a segment on chromosome 7 is shared with Raychelle. The diagram above shows how everyone matches each other, with the last one again showing my mom with Raychelle and that consistent block of segment. So the fact that we all shared an overlapping segment in common with each other indicates that particular segment was inherited from our common ancestor. In this case, both Isaiah LEWIS and Polly HOLMES. But how do we figure out if that segment came from Isaiah vs. Polly? Remember that there was a discrepancy that Polly’s two husbands – Isaiah LEWIS and John LEWIS were paternal half-brothers according to some other genealogy and that Isaac LEWIS KANAE was Isaiah’s son, while John George LEWIS was John LEWIS’ son. Both Isaac and John had the same mother – Polly HOLMES. 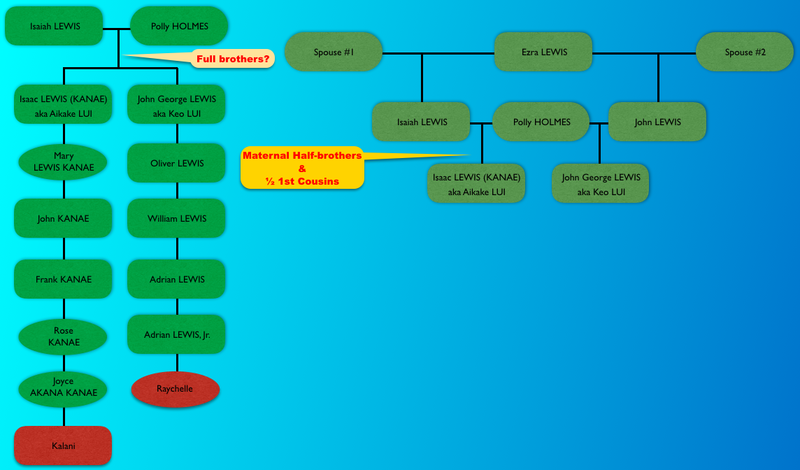 The best way to distinguish that inherited segment being inherited from Isaiah LEWIS or Polly HOLMES is to test members of each of those families. That would be distant relatives of whom we cannot find a connection to just yet. Instead, I used another method. Since my mother tested at 23andme, they have the ability to show the ancestry broken down by each chromosome. This is what my mother’s 7th chromosome looks like. 23andme identifies portions of the Hawaiian segments of the chromosome as a combination of East Asian & Native American, and Oceanian. I simplified it by just indicating Hawaiian. Both of my mother’s parents were Hawaiian, but her mother Rose KANAE also had European ancestry. Which is why in that diagram one chromosome is labeled as the paternal chromosome, the other as the maternal. My mother’s maternal grandmother was Rose HOLBRON. Rose’s paternal grandfather John HALBORN was from Hull, England, and her maternal grandfather William LUDLUM was an American whaler from Jamaica, Queens, New York. 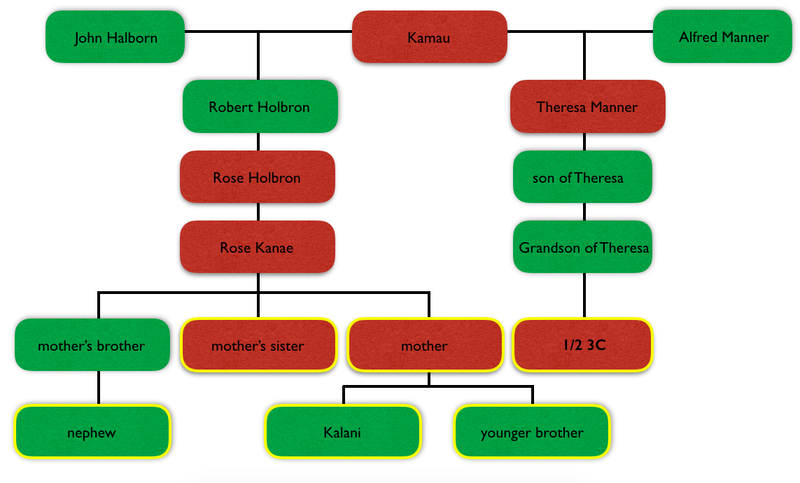 Rose HOLBRON’s grandmothers were Hawaiian (Kanaka). 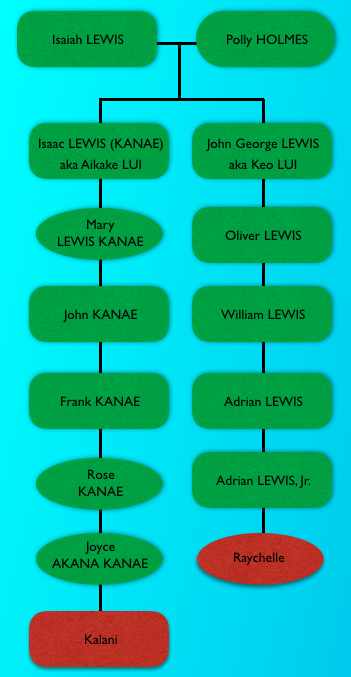 But it is Rose KANAE’S father – Frank KANAE whose paternal grandmother Mary LEWIS KANAE’s father was Isaac LEWIS KANAE. Isaac’s father was Captain Isaiah LEWIS. 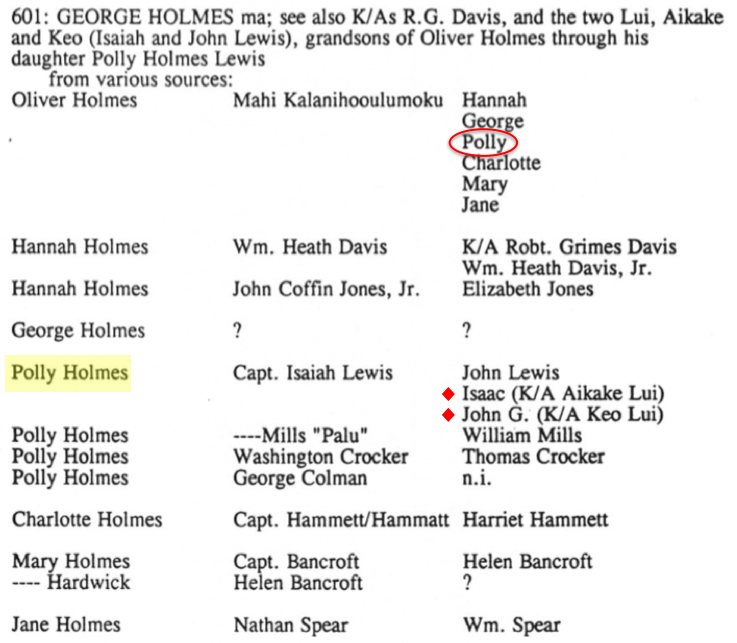 Isaac’s mother Polly HOLMES was the daughter of Oliver Holmes of Kingston, Plymouth, Massachusetts and Mahi, daughter of the chief Kalanihooulumokuikekai of Ko’olau. My assumption was that the European portion from Rose KANAE’s father is too far back. In other words, the European portion of that chromosome that my mother inherited from her mother could have only come from John HALBORN or William LUDLUM, or a combination of both. 1) The length of the chromosome. 2) How many cross-over events there were for that particular chromosome. 3) Location on the chromosome (some areas are more SNP dense than others). 4) The possibility of having fewer cross-over events or none at all (we see this happening as well). This segment seems to match nicely ranging from 7.1cM (my mom) to 9.1cM (Aunty Stella) with all the relatives. So when I visually compare the section of chromosome 7 that matches up with the shared overlapping segment for all of us, this is where they line up. If you have read my other posts, you would have read that multiple segments for Polynesians can remain for awhile given that we come from a few common ancestors multiple times. 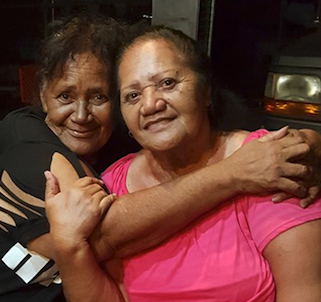 This paritcular segment had to have come via Polly HOLMES’ mother – Mahi who got it from her parents Kalanihooulumokuikekai and his wife. And since Raychelle is also a descendant of Polly HOLMES and Isaiah LEWIS, this portion of chromosome 7 did not come from my HOLBRON side. While my family members used for comparison descend from Isaac LEWIS KANAE’s daughter Mary LEWIS KANAE, there are other descendants through Mary’s sister Papanaha LEWIS KANAE who got DNA tested. But only one of them was a match to Raychelle. This cousin shares an overlapping segment of 8cM on chromosome #7. But when I compared that relative to my mother, they did not share that particular overlapping segment, although all my other close relatives did share that overlapping segment with this cousin. After looking into it further, I found out that my mother seemed to have inherited a smaller section of that overlapping segment compared to other family members, and her matching criteria just did not qualify as a match according to GEDmatch.com where all of this analysis was done. After all, she shares the least out of all the relatives only 7.1cM of this segment and Aunty Stella shares 9.1cM. And while she gave me and my brother Kaimi this segment, my brother Travis did not inherit this segment. Which means this portion of chromosome 7 for him was from our grandfather, not our grandmother Rose KANAE. But that is what is complicated about mapping out segments for Polynesians. 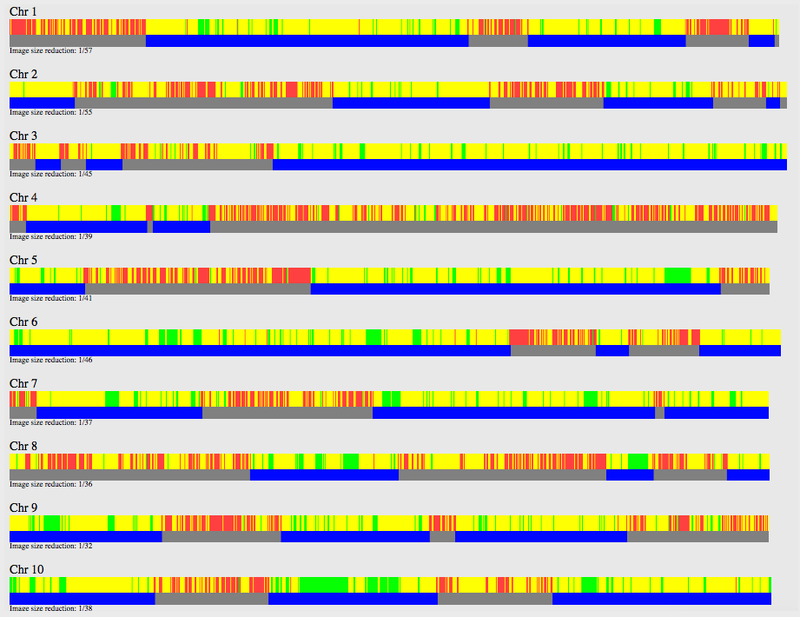 These segments could be from any of these lines going back to the same common ancestor multiple times. That means that Raychelle could just so happen match all of us via my maternal grandmother Rose KANAE’s mother’s side, or my great-grandfather Frank KANAE’s mother’s side, or John KANAE’s father’s side, and so forth. It could also be just by chance, that we share the segment with any other of her Hawaiian ancestors. Since many Polynesians share multiple small segments and as small as 7cM, as well as having these segments line up very close to each other if not right next to each other, it makes chromosome mapping very difficult to do. 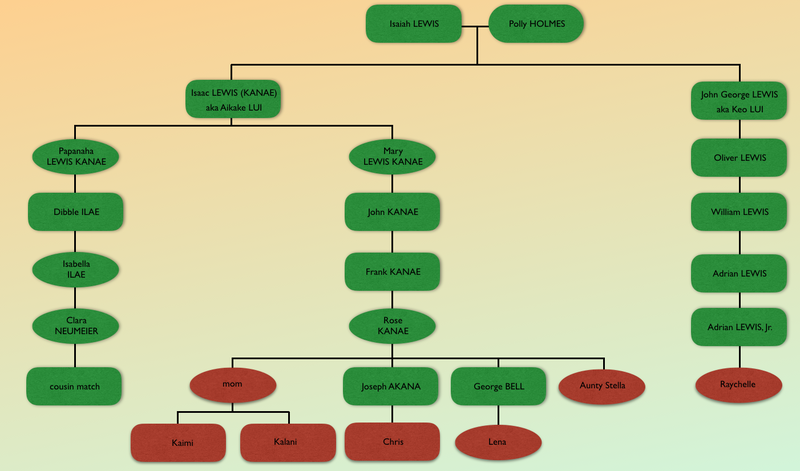 For example, I mentioned one of Papanaha LEWIS KANAE’s descendants share that same overlapping segment on chromosome 7 with the rest of us, while the other descendants share multiple non-overlapping segments. I cannot easily assign them to our common ancestor – Isaac LEWIS KANAE, or presume that all of these multiple segments came from our common ancestor. Since Polly HOLMES is 6 generations away from my mom and all of her descendants share this same overlapping segment, it is safe to presume that this segment came from Polly HOLMES’ mother – Mahi. And now I can assign at least this small portion to Mahi. In my last entry I demonstrated the difficulties of determining the half-relationships after receiving the DNA results of my half-first cousin. Within an endogamous group, that could be even more difficult as we see larger amounts of DNA shared. 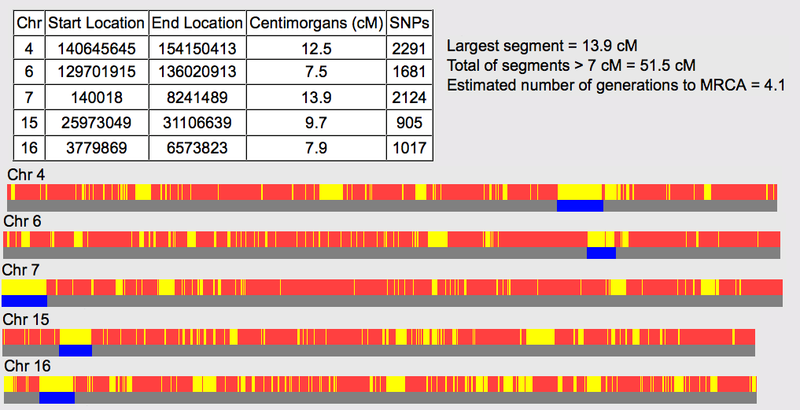 While the ISOGG Wiki Autosomal DNA Statistic page can list the average amount of centimorgans shared, Blaine Bettinger’s The Shared cM Project demonstrated that the minimum and maximum amounts shared can vary. This becomes more evident as the distance of relationship increases. Within an endogamous group it makes sense that having more than one pair of common ancestors may increase that amount. The same would apply if you descend from the same common ancestor multiple times. Both would produce higher amounts shared. A few months ago I got the results of my aunt believed to be a full-sister of my mother. My aunt suspected that her father was not her biological father. And she was right. But she was not the only one who knew of this, but the rest of the family, particularly the ones of my generations believed that this Aunt’s father was her biological father and did not suspect otherwise. The top is my mother’s sister while the one right below it belongs to my half-1st cousin whose father George was mentioned in the last entry – Determining half-relationships with Polynesians. Initially I was confused by the total amount since I knew it was more than what I shared with two of my half-brothers. This is how two of my half-brothers compare to me and to each other. So my mother and her sister did share a bit on the high-end for half-siblings, but low end for full-siblings. These are the predicted averages shared for siblings vs. half-siblings. The next step was to take a look at the X chromosome. For half-sisters who had the same father, they would share an entire X chromosome based on how the X is inherited. To my surprise, it looked like someone took a razor blade and sliced out some pieces of the image. For half-sisters they share a lot compared to what I saw when comparing my half-brothers to each and to me. Also, I decided to include both the default 5+cM setting and the 1+cM. With my brothers, we hardly get anything when I lower it to 1+cM. But with my mother and aunt, you can see a difference although chromosomes 4 and 18 are more likely to be IBS, but given the situation (endogamy, small communities, & isolation) it just may be IBD from a very long time ago. So the X was not helping me one bit since I thought maybe they were areas on the chromosome that could not be read – no calls. I immediately uploaded to GEDmatch for further analysis. No surprise that when I looked at the X, it was the same exact thing. Knowing that it wouldn’t be helpful, I turned to the other 22 pairs of chromosomes. What you would be looking for in full-siblings are full-identical regions (FIR) which are the green sections on the bar graph. Here is an example of my 1st cousins, a brother and sister. About 25% will be fully identical. You can read more about how much full versus half-identical regions siblings would share at ISOGG’s Wiki – Fully Identical Region page. This is what my mother and aunt showed. There are only small chunks of FIR rather than long segments of it that you would see in full-siblings. So this confirms a half-sibling relationship. I recently got my cousin’s results to compare to my mother and my brothers. This cousin’s father was my mother’s half-brother George, so a half-first cousin relationship. Prior to making contact with my mother’s relatives I was thinking of having these cousins tested as a means to figure out who my mother’s biological father really was. But a couple of months ago when I did make contact with these long lost relatives it was revealed that my mother’s biological father was Joseph Kaapuiki Akana, the man whom I doubted was my mother’s father based on his name (Akana is of Chinese origin) and the fact that my mother remembers her father being pure Hawaiian and her DNA composition does not support Chinese ancestry. I thought that maybe testing these half-cousins would determine if their grandfather was my mother’s biological father. But it is more complicated than I realized. Like my mother’s father Joseph Kaapuiki Akana, George’s father was also Hawaiian. George and my mother shared the same Hawaiian mother. 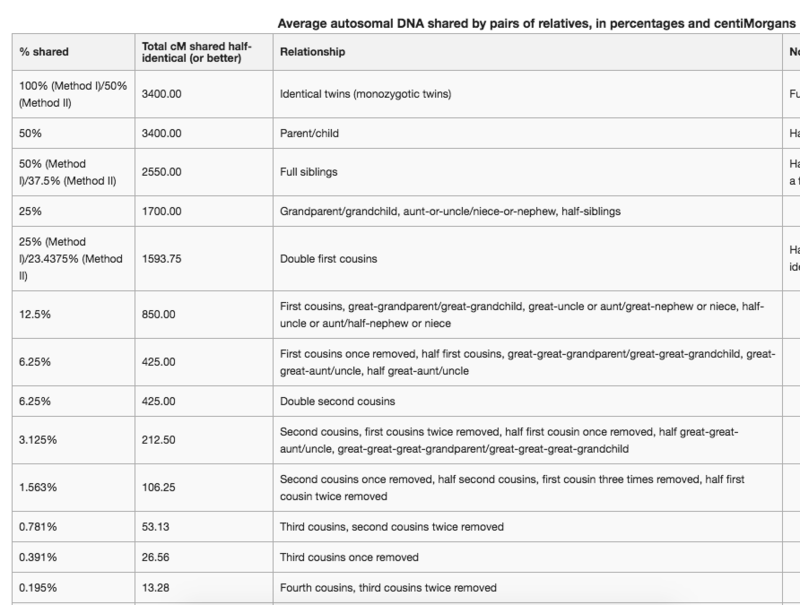 This is what the ISOGG Wiki Autosomal DNA Statistics page says about how much should be shared between a half-aunt and also to half-cousins. Combining with Blaine Bettinger’s Shared cM Project, the total shared for a half-aunt would range from 540cM to 1348cM, averaging 892cM. The average is around the amount indicated by the ISOGG Wiki page. For a half-first cousin, Blaine Bettinger’s Shared cM Project says it would range from 262cM to 1194cM, averaging 458cM. Again, that average is what is indicated on the ISOGG Wiki page. This is how GEDmatch.com compares my half-cousin to us. It is obviously on the high end, for a half-aunt while half-first cousin, not that extreme. But we are talking of one example only. There are more half-cousins that I could have test and probably will in the future. And all of these cousins have had a grandfather that was Hawaiian, so I would expect their amounts to be high. Comparing to non-endogamous groups, I compare my paternal aunt to her nephews and nieces and a great-nephew and great-niece on GEDmatch. 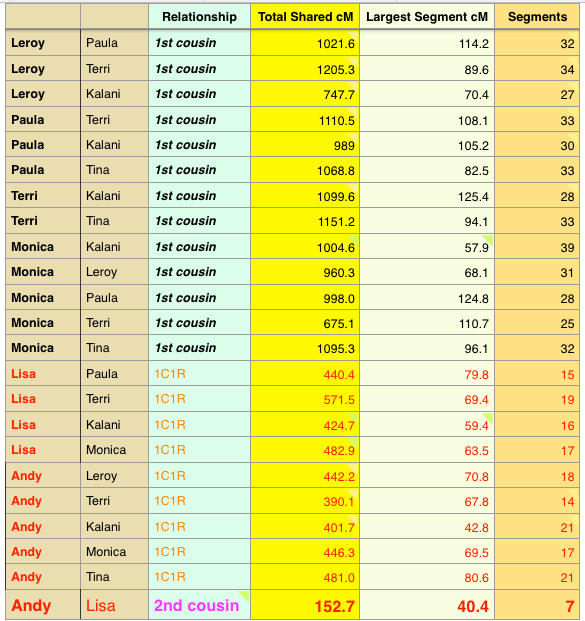 My cousin Terri may share the lowest total among the 1st cousins but it does not seem that significantly different from the average 1700cM. It is interesting to see that her largest segment is 104.7cM. When I look at my half-first cousin and how much she shares with her half-aunt (my mother), the total is 1412.8cM, and largest segment is 103.3cM. That figure can be misleading. I have more cousins on my father’s side that I have yet to test and there may be other cousins who share less or more with our aunt than the cousins that have already tested. If I take my aunt out of the equation, this is how the cousins compare to each other. A couple of my paternal 1st cousins share much less with each other than my half-cousin does with me and my brothers. It will be awhile before I can get an ample amount of Polynesians who have close relatives tested to fully make a comparison. 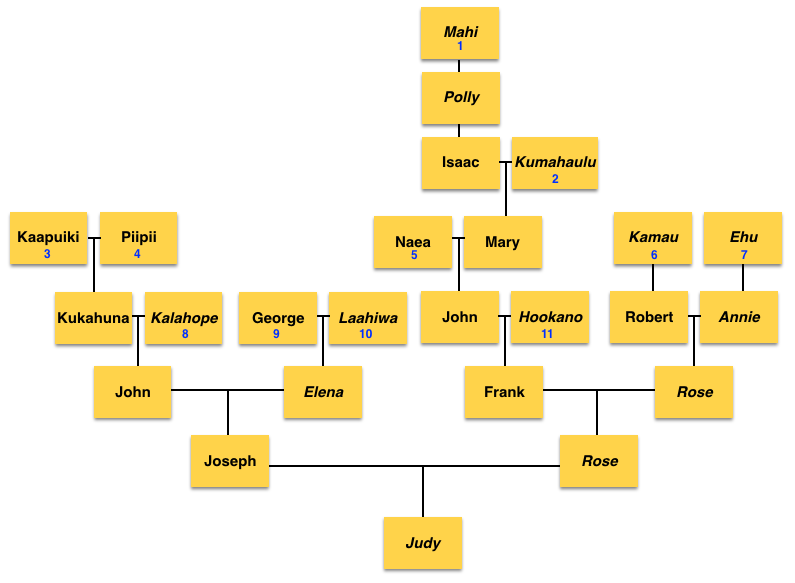 Initially I wanted to see if testing half-cousins would help determine if my mother’s siblings were half or full siblings and when I was not certain that Joseph Kaapuiki Akana was her biological father. It is clear now that any type of half-relationship is difficult to determine if the other parent is also Polynesian, and in our case Hawaiian. My grandmother married 3 different Hawaiian men and so far from what I know, they have ties to geographically different places. The endogamous nature just makes it hard to determine the relationship even if it is a close relationship. It does not have to be a distant 3rd cousin and beyond to appear as a closer relationship. Even with cousins (half or full) and half-siblings, they seem to appear on the higher end of the relationship, possibly giving a false prediction if the true relationship was not known. 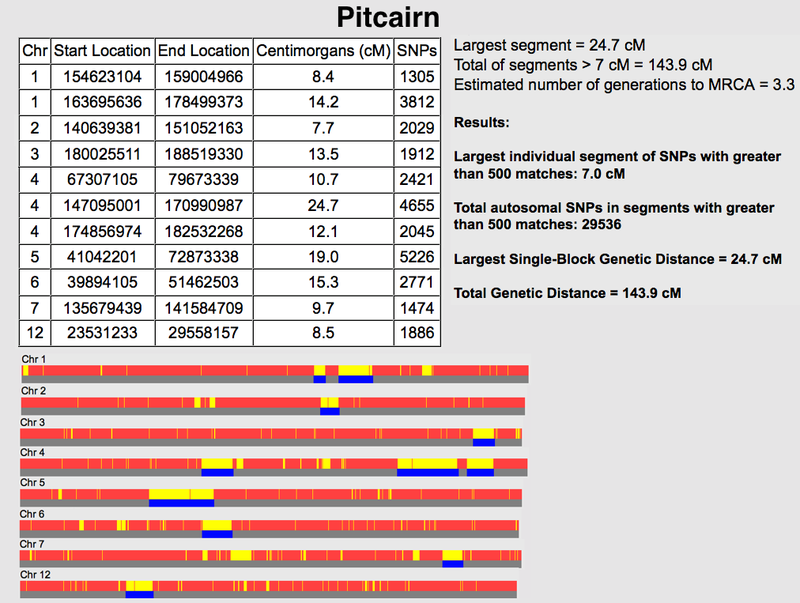 I finally got the autosomal results of a Pitcairn resident who has been a member of the Polynesian project for a year now. Previously I had another member who is a Norfolk island descendant and whose ancestors moved to Norfolk but were originally from Pitcairn. Another Norfolk descendant tested at another company, but his raw data were uploaded to GEDmatch.com in order to be compared. Now having that this particular Pitcairn resident tested, I can make a comparison for these 3 people since they all have ties to Pitcairn. Pitcairn was settled in 1790 by mutineers of the HMS Bounty and Tahitians1. The initial population of 27 consisted of 9 mutineers, 6 Tahitian men and 11 Tahitian women along with an infant girl. Only 6 of the mutineers and 6 Tahitian women would produce descendants. The population started with 27 people but only 12 of them would produce descendants. By 1840 the population exceeded 100, and by the mid-1850s the community was outgrowing the island3. On May 3, 1850 the entire community left for a 5 week trip and settled on the island of Norfolk on June 8. Nearly 3 years later 16 of them returned to Pitcairn. I have mentioned in previous blog entries that eastern Polynesians are genetically less diverse than western Polynesians. So it should be no surprise that Hawaiians and Maoris as well as Tahitians will come up as closer matches to each other despite sharing common ancestors 8 centuries ago. Now we are looking at two things. Firstly, a founding population where only 12 people produced offspring, and half of the 12 being Tahitian women, or eastern Polynesians. And these 12 were not paired off equally. They married multiple times, some of them never produced descendants with their other spouses. Secondly, there was a population bottleneck in 1859. In 1856 the population expanded to 193, then the entire population left. That population was already interrelated just 66 years after the initial 12 founding people started the population. They all left, but 16 of them returned. Eventually, a few more returned but the remaining population continued life on Norfolk island while the rest of the Pitcairns were starting the population again. It would take only 23 years to repopulate the island increasing the population to 250. The Pitcairn resident descends from all of the 12 founding people. No surprise, given that small amount plus that was just 225 years ago and 7 generations ago for this particular person. Although I cannot show with a family tree how many times they descend from the 12 founding people due to size and the complexity of the tree, I decided to list the number of times they descend from each of the 12. Paternal grandfather – Christopher Warren, son of George Warren whose mother was Agnes Christian, and Alice Butler whose mother was Alice McCoy. Paternal grandmother – Mary Christian, daughter of Sidney Christian & Ethel Young. Maternal grandmother – Ivy Young, daughter of William Young & Mercy Young. Agnes Christian and Alice McCoy were 2nd cousins, great-granddaughters of Fletcher Christian and Mauatua. Ivy Young’s parents William and Mercy Young were 2nd cousins two ways to each other. Great-grandchildren of Edward N. Young and Toofaiti and of Fletcher Christian and Mauatua. As confusing as it seems, you can imagine how would DNA show up. After uploading the raw data to GEDmatch.com for further analysis, I immediately ran the “Are Your Parents Related” tool. It predicted 3.3 for the most recent common ancestor (MRCA). Still not sure how to interpret GEDmatch’s MRCA estimation, but in reality, the most recent common ancestor would be their 2nd great-grandparents – Thursday October Christian II and Mary Polly Young. And there were other Youngs as I previously mentioned and Christians as well. When I ran my mother’s kit through that same tool, her largest segment was 13.9cM, and there were a total of 5 segments that would total 51.5cM. Unlike the Pitcairn resident whose largest segment was 24.7cM and with 11 segments. My mother’s parents were from different islands and as far back as I was able to trace their ancestries, they did not intersect nor did their ancestors come remotely near to each other given that they were from 3 different islands. 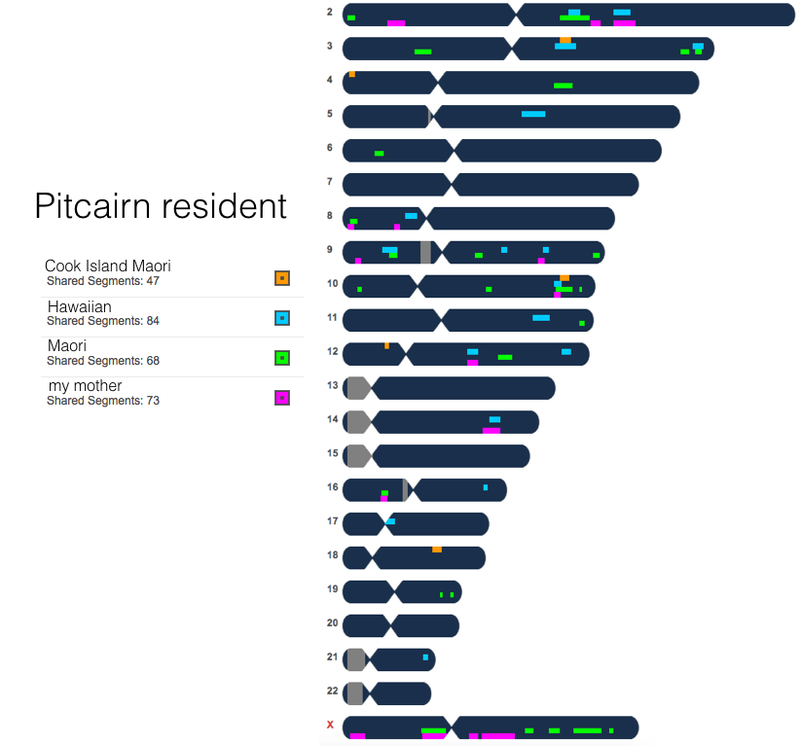 I would love to get more Pitcairn residents to test, to see if there is any noticeable pattern using this tool, or David Pike’s ROH. If there is, we definitely could use it in helping to determine a true close genetic match versus an endogamous one. There are 2 particular matches to many of the Polynesian DNA project’s members and both of these 2 people are descendants of Norfolk residents. I will refer to them as Norfolk #1 and Norfolk #2. Norfolk #1’s maternal grandmother was from Norfolk and she was the daughter of Francis Nobbs and Ruth Christian. Norfolk #2’s maternal grandfather was from there, and his parents were William Adams and Sarah Christian. A further breakdown where I bold the founding people. Sarah and Maria Christian were daughters of Charles Christian & Tevarua, while Mary Christian was their 1st cousin. 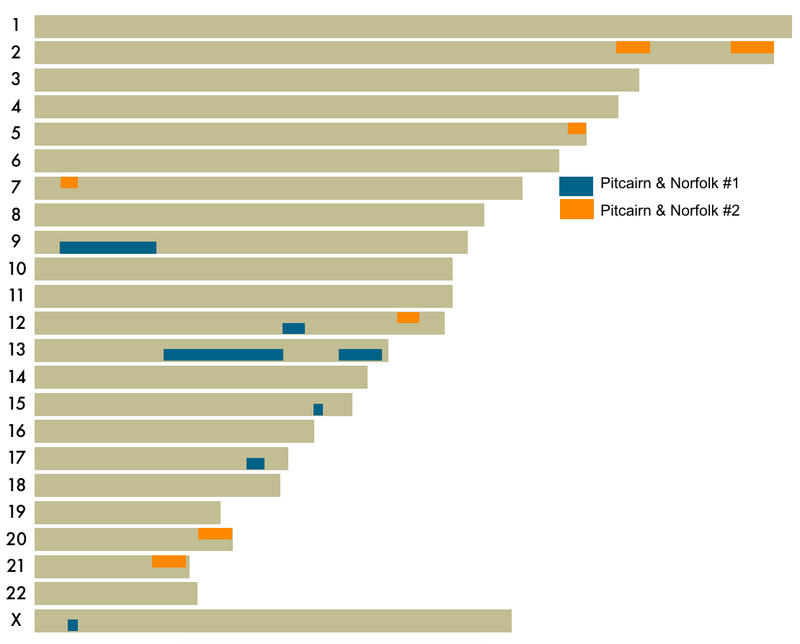 When comparing the two Norfolk descendants to the Pitcairn resident, I was surprised to see no overlapping segments. It is interesting to see how for Norfolk #1, the largest segment is 40.85cM for the largest segment and a total of 134.5cM. 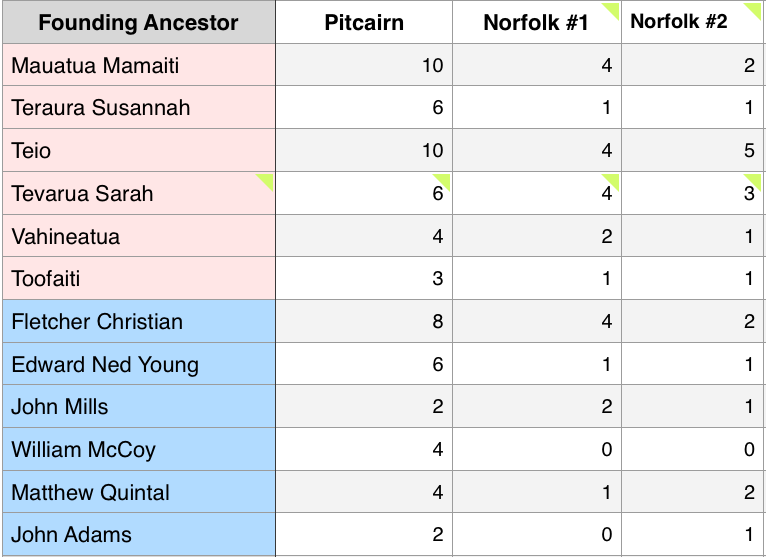 The largest segment is significant, and although Pitcairn & Norfolk #1 are related multiple ways, the closest known relationship makes them 4th cousin once removed. Comparing Pitcairn to Norfolk #2, the largest segment is 27.3cM, which for Polynesians in general could be pretty distant. Total shared is 95.1cM. And just as with Norfolk #1, Norfolk #2 and Pitcairn are related multiple ways, but the closest relationship makes them 4th cousins. 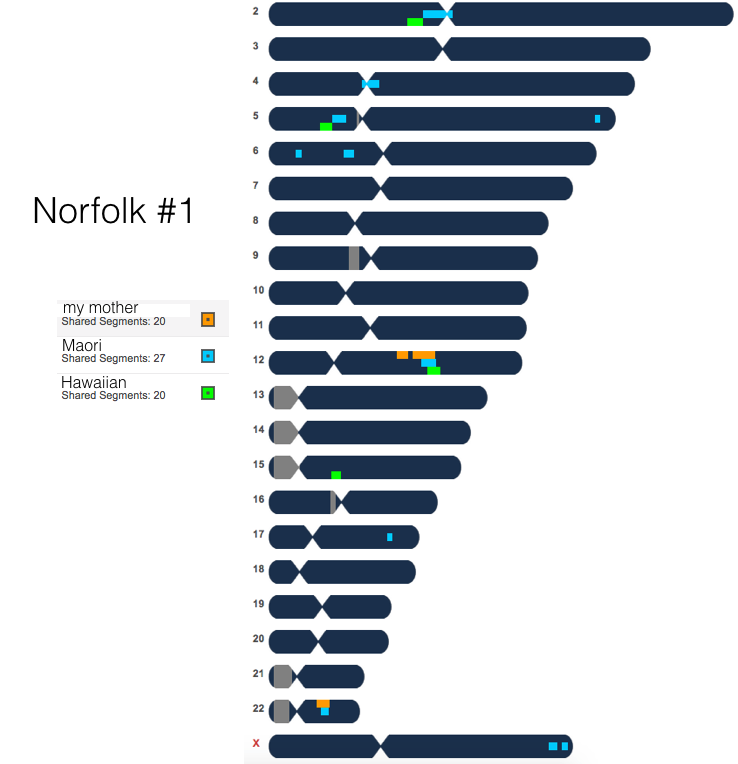 At the moment I cannot compare Norfolk #1 and Norfolk #2, but I am trying to get one that taken care of in order to upload Norfolk #1’s raw data to GEDmatch for further analysis. I was expecting to see the overlap at least when comparing to the Pitcairn resident given that their ancestors’ have been on the island since the beginning, but it goes to show how unpredictable and random DNA can be. A list of all 3 and how many times they each descend from the following founding population. And while various Polynesians can be compared to all three of these people and may show overlapping segments, there is really no way to map these segments. These 3 testees would match other project members based on segments inherited by one or more of these 6 Tahitian women that settled on Pitcairn. And we all would have shared common ancestor(s) from at least 8 centuries ago. Below I compare the Pitcairn resident to a Hawaiian, a Maori and a Cook Island Maori as well as my Hawaiian mother. Incidentally, there is a project member whose father was from Tahiti, yet that person does not come up as a match. 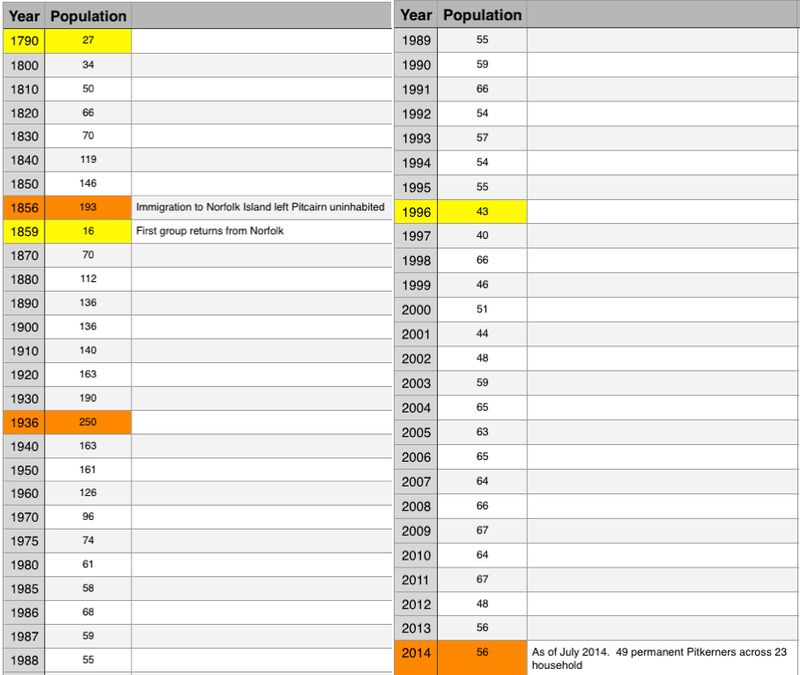 Comparing Norfolk #1 with the same people with the exception of not being a match to the Cook Island Maori. 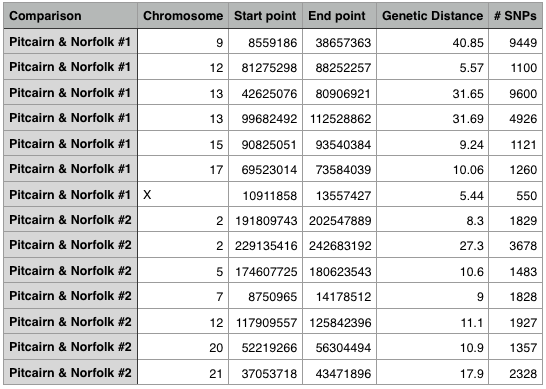 Norfolk #2 did not test at FTDNA but at 23andme, and although their raw data was uploaded to GEDmatch.com, all the others being compared were not uploaded except for my mother’s raw data. For additional information about the DNA study of the descendants of the Mutiny on the Bounty, see ‘Mutiny on the Bounty’: the genetic history of Norfolk Island reveals extreme gender-biased admixture. 1. History of the Pitcairn Islands. 2. Pitcairn Settlers lists an additional Tahitian woman known as Sully, as the wife of Matthew Quintal and the mother of Matthew Jr., John, Arthur, Sarah and Jane Quintal. Another source, as well as the Pitcairn resident who got DNA tested, claims that there were only 6 Tahitian women of whom they descend from. There was no mention of Sully, although Tevarua is listed as being married to Matthew Quintal and the parents of Matthew Jr., John, Arthur, Sarah, and Jane Quintal. 3. 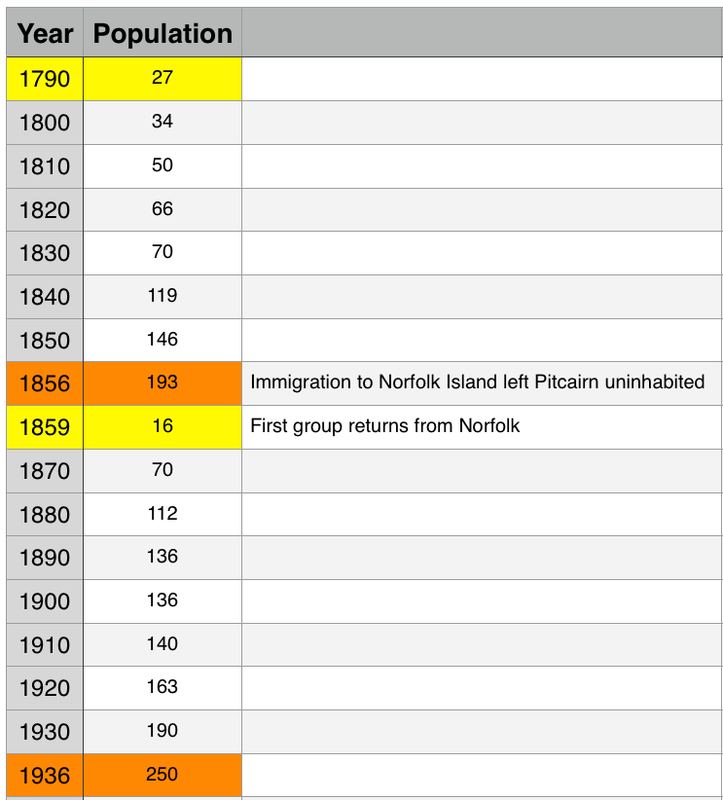 Historical Population of Pitcairn. Another useful tool for DNA testing is to answer those questionable paternity that either was brought up by a family member or documentation may not support what is known. This was one of the main reasons why I got DNA tested in the first place. Quite a bit of people getting DNA tested are finding what is known as an NPE (non-paternal event) or a misattributed parentage. That is when the presumed or putative father was not the biological father. This could have happened either recently, a generation ago, or way beyond that to where current living people may not be aware. This is when people need to take the extra steps by testing other family members or also getting other specific tests, such as a Y-DNA test. Sometimes it can be a Y-DNA test that makes people realize that there was an NPE. Back in July of 2015 I figured out who my mother’s biological mother was. Her name was Rose Kanae, and Rose was married three times. 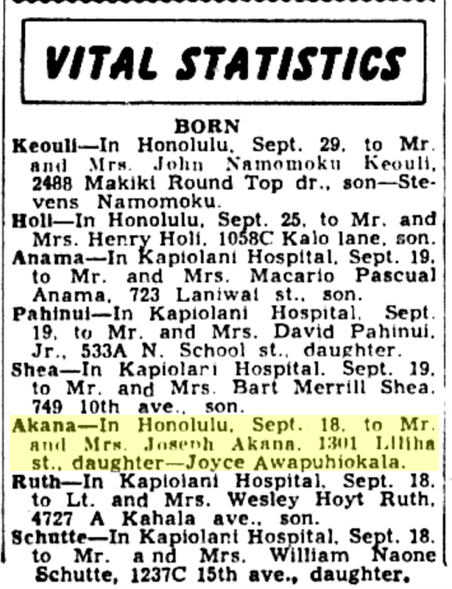 I found that one of her husbands — Joseph K. Akana resided at the same address where my mother was born. So the assumption was that he was probably my mother’s biological father. The Akana surname is of Chinese origin, and it is what initially made me believe that he was not the biological father. My mother was told after having met Joseph Akana once as she was 5 years old, that he was a pure Hawaiian man. Last October a cousin confirmed that Joseph indeed was my mother’s biological father. It was explained to me by a couple of relatives that Joseph took the surname – Akana from his Aunt who married a Chinese man surnamed Akana. Joseph’s original name was Joseph Kaapuiki, and later he went by Joseph Kaapuiki Akana. This same cousin who confirmed that Joseph was my mother’s biological father did question Joseph’s paternity, suggesting that Joseph’s mother Elena Kauhi was not so faithful. This is how I was able to confirm that Joseph’s father – John Kaapuiki was his biological father. Below is my mother’s top 5 matches. 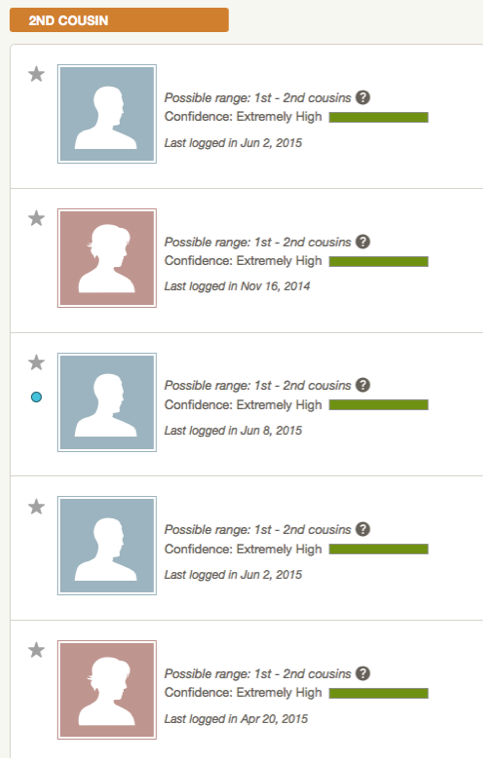 These all say “Possible range: 1st – 2nd cousins.” Her first match is how I was able to figure out who her biological mother was. This is how Frank is connected to my mother. Frank and my mother are actually 1st cousins once removed, making Frank & I second cousins. With females there is less ambiguity whereas with men there can always be that questionable paternity. The second top match was “lkauhi” and this is how that person actually is related to my mother once I was able to get my grandfather’s genealogy. “lkauhi” is off to the right, and she matches my grandfather Joseph Kaapuiki (Akana) via his mother’s side, through Elena Kauhi. This would confirm that Joseph is the biological father of my mother since “lkauhi’s” grandfather Johnathan and Joseph’s mother Elena were brother and sister. One of my cousins gave me the names of our grandfather Joseph Kaapuiki Akana’s ancestors going back as far as his grandparents. His father John Kaapuiki‘s father was Kukahuna Kaapuiki. 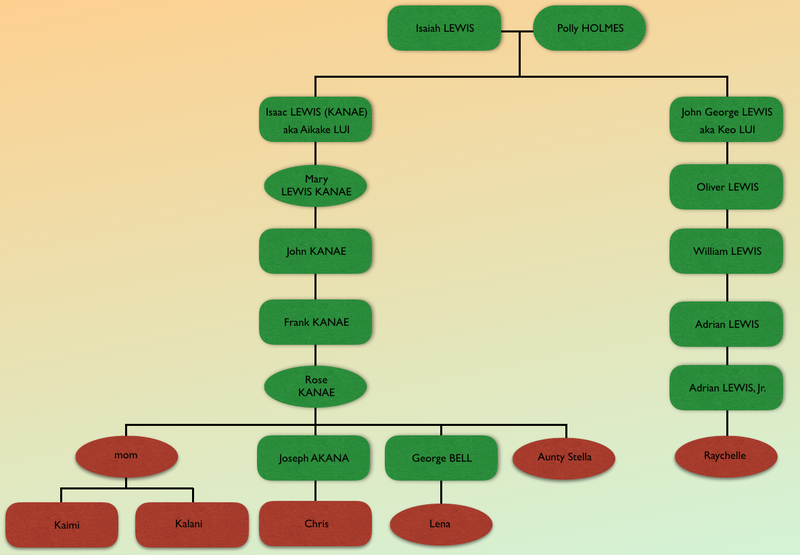 Further research online revealed that the Akana-Kaapuiki family listed my ancestor Kukahuna and traced it a few more generations back. But I was not confident at first to know that any of the names beyond Kukahuna were my own ancestors. This is the same family that I was told my grandfather Joseph took his surname from, and that they were related. Given that they listed Kaili Kaapuiki who married a Chinese man surnamed Akana as the sister to my ancestor Kukahuna Kaapuiki, I knew that was probably the connection but could not confirm it through documentation. 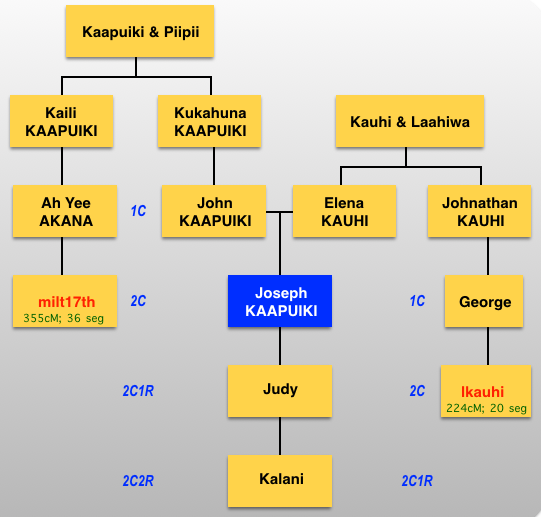 I looked for the genealogy of my mother’s 3rd match “milt17th.” I contacted him and he confirmed his genealogy, that he was the grandson of Kaili Kaapuiki and Akana. This confirms that John Kaapuiki was the biological father of my grandfather Joseph Kaapuiki Akana. 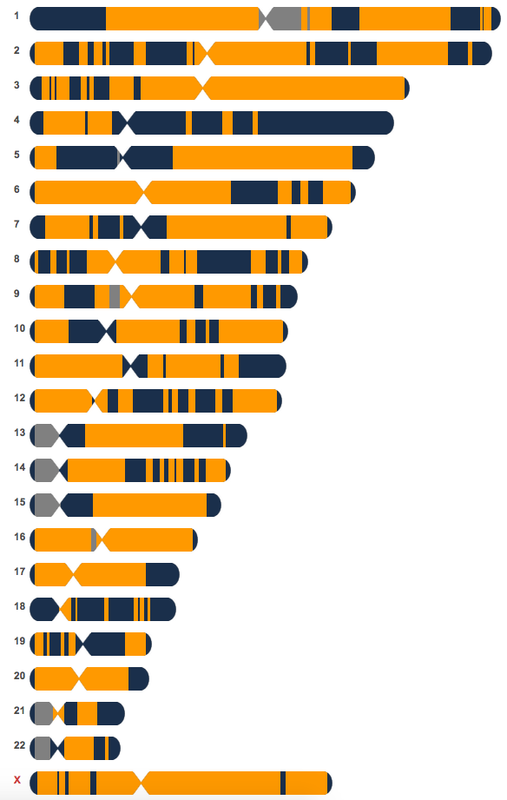 Now that Ancestry is able to show how many centimorgans and number of segments are shown, I was comparing my top two closest matches. They are listed as “lkauhi” and “Frank”. 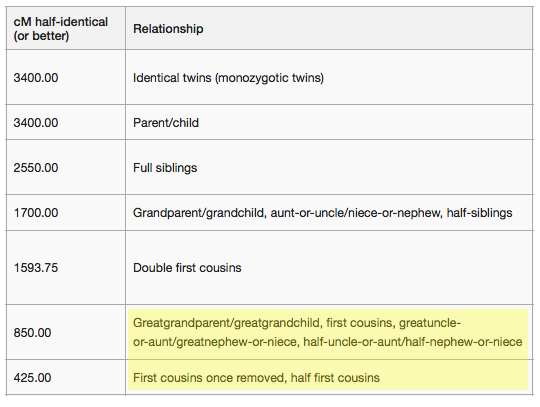 They are under the 2nd cousin category predicted in the 2nd – 3rd cousin range. Prior to my mother getting DNA tested, I had no idea exactly how close they would really be. Now that my mother got DNA tested and I figured out who my mother’s biological parents were, I was able to construct a diagram. 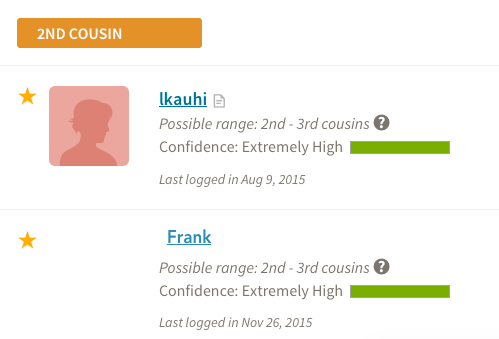 “lkauhi” is on my grandfather’s side while Frank is on my grandmother’s side. How Frank & “lkauhi” are related to me. My mother Judy is a 2nd cousin to “lkauhi”. That makes me and “lkauhi” 2nd cousins once removed. While Frank and I are 2nd cousins, because his mother and my mother are 1st cousins. Here is how much Frank and I share and how much “lkauhi” and I share. And although my mother shares 439cM with Frank while sharing 430cM with “lkauhi” (not shown in any diagram), the amount shared seems pretty high for a 2nd cousin. However, we are talking about Hawaiians whose ancestors have gone through repeated founder’s effect which resulted in our high shared amounts. She in return managed to pass unto me more of her father’s DNA so that when compared with “lkauhi” we end up sharing more compared to Frank who is in my generation and on my grandmother’s side of the family. Unfortunately my grandparents are not alive to get them DNA tested for a true comparison. Also, both of these people have not transferred over to GEDmatch so I am unable to get a better comparison. This reminds me of what my cousins said about how much I look a lot like our uncle, and that both my mother and I really look like my grandfather Joseph Kaapuiki. Maybe it is something genetic? If my mother shared a lot with “lkauhi”, it could be because we inherited more from Elena Kauhi, my mother’s paternal grandmother. The good thing about all of this is that it confirms that Joseph Akana fka Joseph Kaapuiki was my mother Judy’s biological father, since Joseph’s mother was Elena Kauhi. And “lkauhi’s paternal grandfather Johnathan Kauhi was a brother to Elena Kauhi. Both of these closest matches are from each of my maternal grandparents’ side. Frank is from my grandmother Rose Kanae’s side while “lkauhi” is from my grandfather Joseph Kaapuiki’s mother Elena Kauhi’s side. Last year I blogged about GEDmatch’s “Are your parents related” where it looks for Runs of Homozygosity or identical alleles on paired chromosome that would indicate a possible close relative. But now that I have found & confirmed my mother’s biological parents, I took a look again at GEDmatch’s “Are your parents related” tool to see their predicted genetic distance. It estimated 4.1 generations to the MRCA (most recent common ancestor). I normally do not go by GEDmatch’s predicted estimated number of generations but in this case because I cannot determine whether 51.5cM is a lot or not, and if 13.9cM largest segment plays a pivotal role or not, I am going by their estimated number of generations. This is my mother’s genealogy. I italicized all females. These are my Kanaka or aboriginal Hawaiian ancestors. The people I specifically chose were at the end of my genealogy branches. I’ve listed their known origins with the names of the place (ahupua’a), district and/or island. The main thing to look for is that both of my mother’s parents Joseph and Rose just do not have families coming from the same areas. My grandfather Joseph’s family was from the island of Hawai’i. 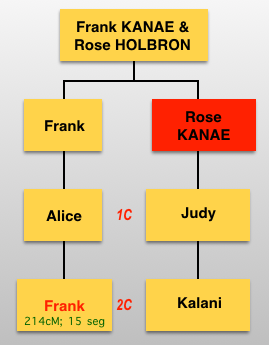 Rose’s paternal grandfather John was from Molokai as well as his wife Hookano. Ehu was also from Molokai while Kamau was from O’ahu. It is not clear where John’s father Naea was actually from. The point of all this is to show how contrary to predicted closeness with all of these DNA companies and even a tool to look for ROH, that there is still no known close connection to my grandparents. Shortly after getting my DNA results back in May 2013, I learned that majority of my DNA predicted connections are an endogamous connection. That means a predicted connection that appears to be much closer than it really is. Being Polynesian (Hawaiian), I am a result of generations of constant bottlenecking and founder’s effect that have occurred through the centuries. This effect is much more pronounced among eastern Polynesians like Maoris and Hawaiians whose homeland were the last places in Polynesia to be settled. Since my mother was adopted and both of her parents were Hawaiian, I knew it was going to be a bigger challenge. Like other Polynesians, documentation for genealogical purpose was limited and it was not until 1860 when King Kamehameha IV passed an act to regulate names did surnames begin appearing for Hawaiians. Even right after that, surnames appearing within families were inconsistent and it varied between families, generations (some starting it later than others) and also islands. 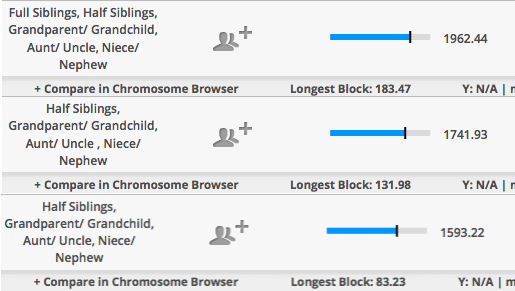 At FTDNA, my mother’s matches can have a total shared cM way above 300 (5 pages of those), while her longest block [largest segment] size tends to stay under 20cM. These are the matches from her 1st page. FTDNA’s requirements for a match allows the tiniest segments to be included once the criteria of the longest block has been met. But in an endogamous population, specifically Polynesians, they tend to report the number of segments to be well over a hundred. 23andme is slightly different. 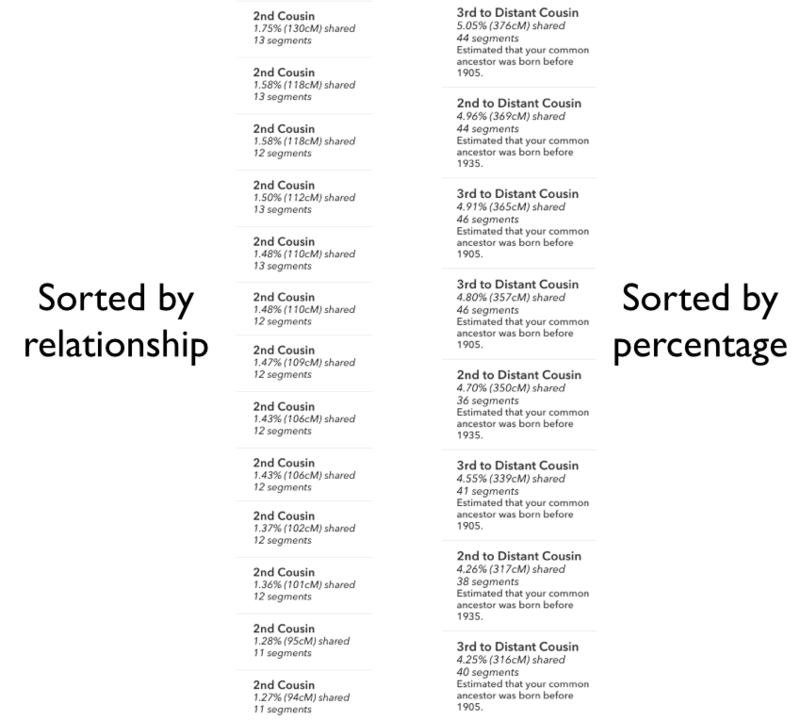 At the default, the matches are sorted by relationship which is shown on the left column, while on the right column is sorted by percentage. This is how GEDmatch.com shows the matches. I expected the matches at Ancestry to be not as close as they were predicted for the same reason seen with FTDNA, 23andme and GEDmatch. 1) Several matches totaled above 100cM. 2) The largest segment usually does not exceed 20cM. 3) Matches are usually Hawaiians who do not match each other at the same amounts, and Maoris of whom we share a distant connection from 800 years ago. As I looked at the Ancestry matches and compared the predicted 2nd – 3rd, or 3rd – 4th cousin predictions and how they appeared on GEDmatch, I noticed that they would fall in a large range of 187cM – 304cM for the total autosomal shared. 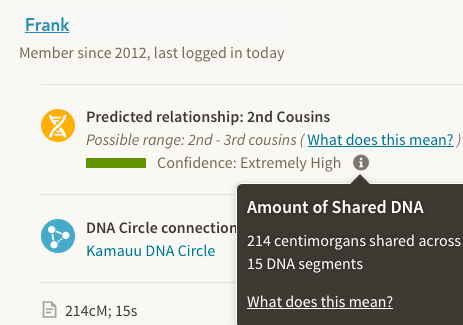 At the time I was trying to compare this close relative, Ancestry did not have the option to see how much you share, unlike now where they list the total amount of centimorgans you share and the number of segments. But still no chromosome browser to do a full comparison. Being able to see the largest segment would be key in determining a true close or distant 2nd or even 3rd cousin relationship. So there are four matches in the 1st – 2nd cousin range (Extremely High) but I could not determine if they just appear to be close, or were true 1st to 2nd cousin matches. Given the pattern with the other companies and GEDmatch, I ignored Ancestry for over a year, until earlier this month when I reached out to my mother’s best match at FTDNA. My mother’s best match belongs to a woman who tested at FTDNA. They share 266.94cM (122.9cM GEDmatch) total, and the largest segment is 50cM. A largest segment size of 50cM is a very good indicator that the relationship was not too distant. I guessed somewhere around a 2nd to 3rd cousin. Last year she shared her tree with me that goes back to her ancestress named Theresa Manner, the daughter of a Swiss man and a Hawaiian woman named Kama’u. This match’s paternal grandmother and paternal grandfather were both Hawaiian. 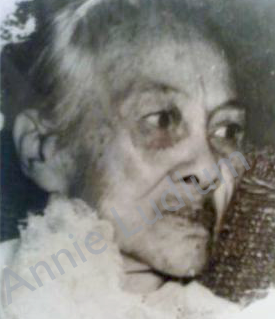 Kama’u was an ancestress on the paternal grandfather’s side. Back in January I began focusing on Theresa Manner’s husband’s line, especially since his family lived in the area where my mother was born. Not to mention I had nothing else for Theresa Manner except her parents’ names, and Kama’u was the only Hawaiian that I saw in that line. My match asked me if I thought there was a possibility that it was her paternal grandmother’s side versus her paternal grandfather’s side. Her paternal grandmother was also part Portuguese, but since we were not getting matches with Portuguese people I excluded the paternal grandmother’s side. Although this match and my mother share 2 segments on the X chromosome, the largest segment 10.2cM while the other 8.8cM, I knew it had to be distant given the unpredictability of the X particularly for Polynesians. So I ignored it and continued to focus on the paternal grandfather’s side. At Ancestry, my mother’s closest match belongs to a man and is the first match at the top of the diagram above. But this match’s tree did not have any names in common with any of the other top matches that we get. No matter how many conversations I have had with this closest match at Ancestry, although all prior to my mother revealing to me in August 2014 that she was adopted, I still was unable to find any close connection. Given the endogamous history and the fact that we just lack genetic diversity, it seemed more of a validation that the match was not as close as it appeared to be. I also focused on my mother’s ancestry, which points to two basic ancestries. East Asian and European. Her Polynesian portion is usually represented by the East Asian and Oceanian categories combined. 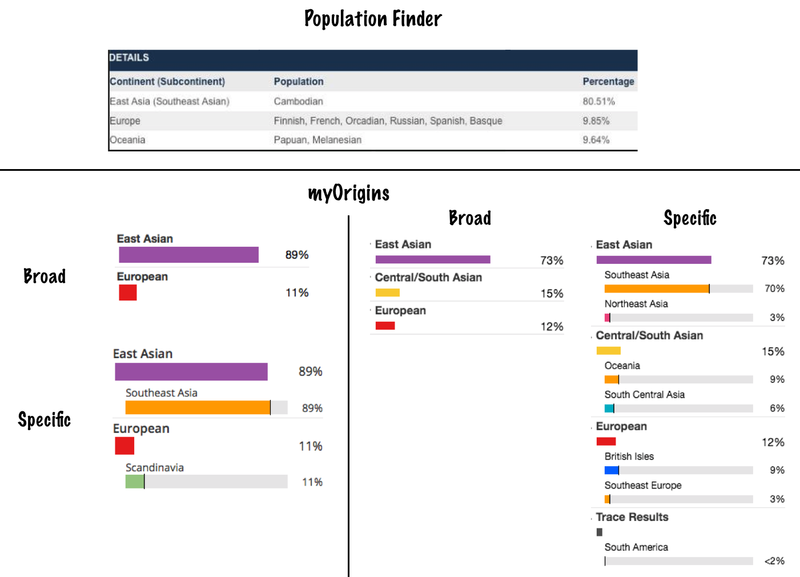 Some companies such as FTDNA’s “myOrigins1” have lumped Oceanian under their East Asia category which previously their “Population Finder” separated them. 23andme also separates the two categories while AncestryDNA recently created a category called Pacific Islander (Polynesia). Below are the results from those companies including analysis from Dr. Doug McDonald2. For simplification I combined the Oceanian with East Asian. 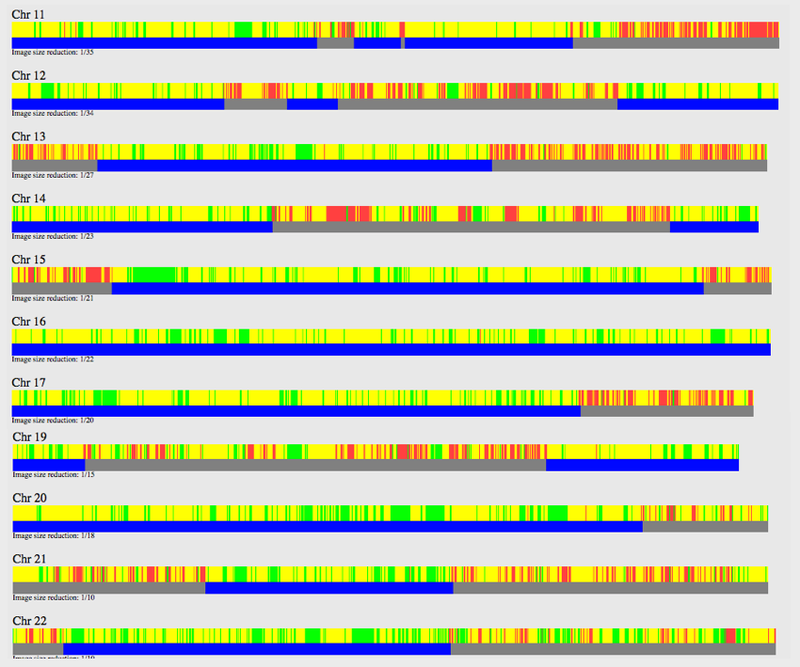 This next diagram shows 23andme’s chromosome view. My mother’s X chromosome was just East Asian/Oceanian in origin. Dr. Doug McDonald also had a chromosome view and he too found that it was only of East Asian. 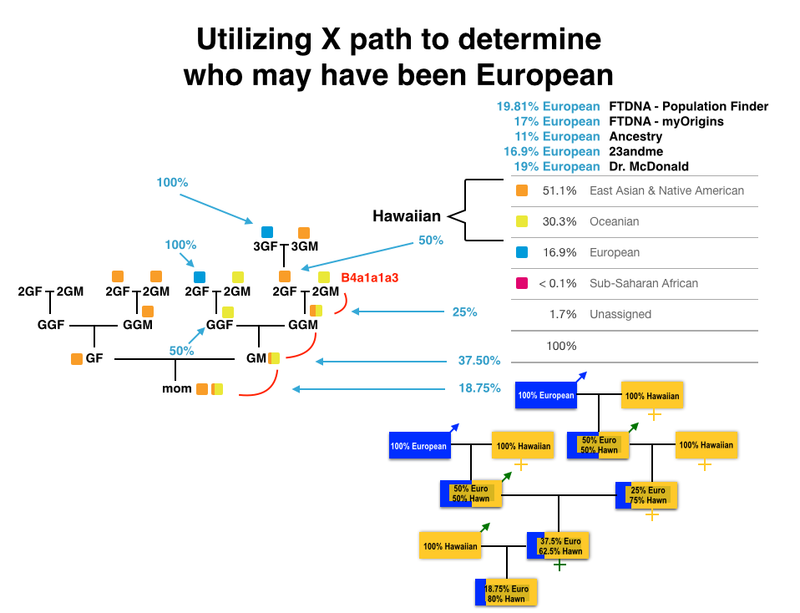 Knowing the X inheritance pattern, plus the amount of European percentage that my mother has, I tried to calculate who would have been the most likely European ancestor that married a Hawaiian. If not European, then of European descent. So I had a few clues that helped me determine how to figure out who that was. 1) My mother recalls meeting her biological father at the age of 5, and claims that he was pure Hawaiian. 2) Our mtDNA haplogroup is B4a1a1a33, a subclade of the Polynesian motif B4a1a1, indicating our direct maternal line as Hawaiian. 3) The odd percentages is probably the result of more than one ancestor being of European and Hawaiian ancestries. Given those details, I constructed this diagram which would be the likely scenario of how my mother got her European and Hawaiian ancestries. I thought that looking for her European ancestors would be easier to trace given the few early European (or American of European descent) arrivals in the Hawaiian Kingdom. Unlike with Hawaiians whose DNA results produce closer predicted relationships than they really are. I calculated both 18 years per generation in that diagram and 25 years for each generation. The 25 year estimate took me to 1868 from my mother’s birth year of 1943, and back to a 50% European/Hawaiian person in that diagram. Theresa Manner was born in 1866, so now I was confident that this could be very useful in tracing my earliest Hawaiian/European-descent ancestor. Comparing this diagram to Theresa Manner and knowing that the estimates of the dates were very close, I realized that I did not go back far enough. Although the predicted 50cM largest segment for a 2nd to 3rd cousin was good, it was best to be sure to go even further. My match at FTDNA also revealed that her father’s Y-DNA results showed a European haplogroup rather than a haplogroup indicating Polynesian origins of which her father has a direct male Hawaiian line. Given this new information and not knowing where this NPE (non-paternal event) could have occurred, either with her father or her grandfather, or even further back, I immediately excluded this line. This was the same line I was previously looking into back in January, focusing on Theresa’s husband and their children and her husband’s siblings and their children. Although still, that would not tell me for sure if that was my mother’s paternal or maternal side. I realized how I was ignoring Theresa Manner, whose father was a Swiss and he married a Hawaiian woman named Kama’u. I asked my match if Theresa Manner had any other siblings. Previously my match only shared Theresa’s parents, and Theresa’s husband and their children. Again, because of the 50cM largest segment prediction, assuming it was pretty close, that I did not have to go back further. But I knew that Theresa Manner was an important clue since she was half European (Swiss father) and half Hawaiian and was born in 1866. That fit into the year I predicted from the diagram that I created in order to come up with the estimated 1868 birth for a male ancestor that was 50% Hawaiian and 50% European. I was told that Theresa not only had 3 other siblings, but also 2 half-siblings. They were Robert Holbron and Mereana (Mary Ann) Holbron. Kama’u was previously married to John Holbron from England. I thought that name Robert Holbron seemed familiar. Since several of our top matches at Ancestry had public trees, I went back there to look and saw that the very top match of whom I have had correspondence with last year listed in his tree Robert Holbron and his wife Annie Ludlum as his ancestors. This match is in the predicted range of 1st – 2nd cousins, although as mentioned previously, it may or may not have been a true 1st – 2nd cousin relationship. But the fact that both of these matches had Kama’u in their line and of whom was probably the one responsible for passing on that large 50cM segment, I knew I found my ancestors. With this new information things fell into place. I referred to the diagram I created and it seemed that Robert was the more likely candidate to fit into what I had constructed as my possible ancestors. But to be sure, I looked into his sister’s descendants first. Mereana Holbron married an Irish man, lived in Ireland and in Hawaii. But Robert appeared to fit the pattern I mapped out more than his sister, although his wife Annie had a surname of Ludlum, which indicated that she was an admixed Hawaiian unlike in my diagram. But even with her being half, I knew that her mother was Hawaiian based on the fact that if Annie were my ancestor, her mother would have passed on my B4a1a1a3 directly to Annie and down to females. And that matched up with my diagram. My match’s tree at Ancestry listed Annie’s parents as William Ludlum and Ehu, which confirmed that Annie was half Hawaiian and of half European descent. Later, I would find that both Robert and Annie’s estimated year of birth fit the diagram and predicted year of birth only off by 13 years. While going through several of the old Hawaiian newspapers I found an article with a photo of Mrs. Annie Holbron celebrating her 100th birthday. I continued looking into Robert and Annie’s children and grandchildren. I focused on their oldest daughter Rose Holbron and her husband Frank Kanae, and who our top match at Ancestry descends from. And although I made sure I covered many of the collateral branches, I still used as a guide the diagram I created to guide me into which branch it could be. And it took me to Rose & Frank’s 3 daughters. While looking for their descendants and who they married, one of them had a photo uploaded into their tree on Ancestry, and I saw the striking resemblance not only to my mother but also to my sister. I found information on her husband and children and she had one child born just a month before my mother was born. So it seemed unlikely that this was my mother’s biological mother. This is on the assumption that my mother’s birth date on her “legal birth certificate” is her actual birth date. I could only assume that it may have been one of the other two sisters who was my mother’s biological mother based on the fact this woman looked like both my mother and sister. I definitely found the right family for my mother’s maternal side. It would be only a matter of time before I find out if the woman whose photo I found was my mother’s biological mother, or her mother’s sister. My mother’s legal birth certificate left questionable details since I began researching 26 years ago. It was because it did not indicate that it was an adoption, unlike my own birth certificate which clearly states that it is an adoption. What was known and is clearly indicated on my mother’s birth certificate. A midwife was present, attested to witnessing the birth of Julia Kawewehi Scott [adoptive mother]. Usual residence of mother was 440 N. King St, which was the permanent residence of both parents. I spent several years looking into the address where my mother was born. I even tried to track down people who lived at the same address hoping to find someone who was alive at the time my mother was born and may know something about her birth mother. Now that I have found the branch that we come from, again I continued to look into Rose Holbron and Frank Kanae’s daughters. I already found one with a photo who resembles my mother and sister. Another daughter I found was married several times, and had children from possibly more than just her own husbands, but this is based on surnames. Her name was Rose Kanae, and her first husband was surnamed Kalei. Her second husband was Joseph Akana, which can be a semi-common name. A lot of Akanas, but not all are related to each other from what I saw with their last known ancestor to some of the Akanas that I found. That surname comes from a Chinese who either became a Hawaiian citizen or just Hawaiianized his name. That surname caught my attention and made me think about it for a bit, but given that I had done a lot of genealogy I know and do remember seeing that name and reading about that surname in other Hawaiian genealogy forums. Then after Joseph Akana, Rose married a third time. All of those husbands gave her children. I was surprised to find in the city directory of 1947, that Joseph Akana lived at 1301 Liliha Street. This was the same exact address where my mother was born. So either this woman got pregnant from another man and Joseph Akana divorced her, or her sister got pregnant and gave birth at their residence. At the same time I found the photo of the woman who could be my mother’s biological mother, my mother called to tell me that she received her non-identifying form from the First Circuit Court in Kapolei, O’ahu, Hawai’i. This form just gives adoptees little information into their background and every state and court has their own way of determining what will be revealed. For Hawaii, it is the ancestry. When I received a copy of it, it indicated that my mother’s mother was Hawaiian and Chinese while her father was Chinese Hawaiian. However, DNA does not support that. 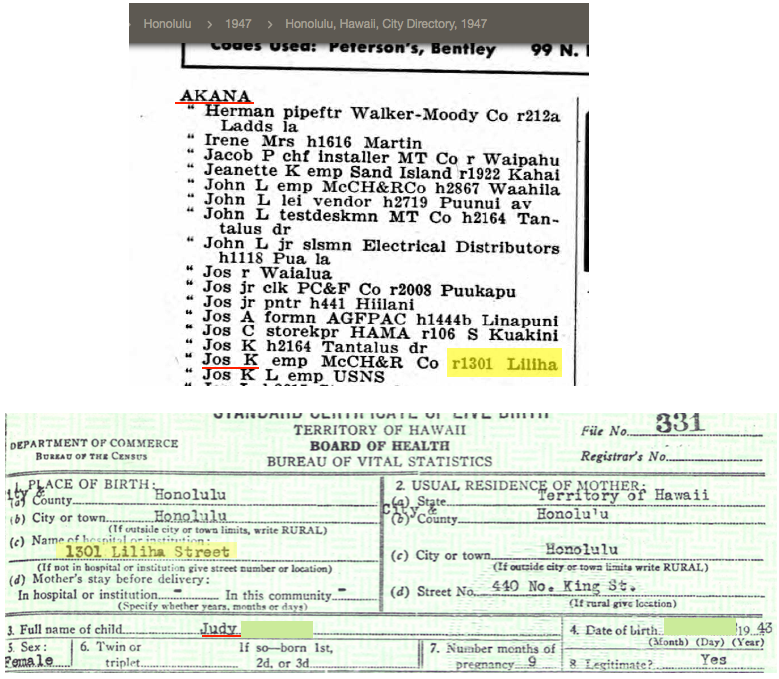 But given the non-ID form indicating Chinese, although incorrect, this was pointing to Joseph Akana and Rose Kanae as the parents listed. 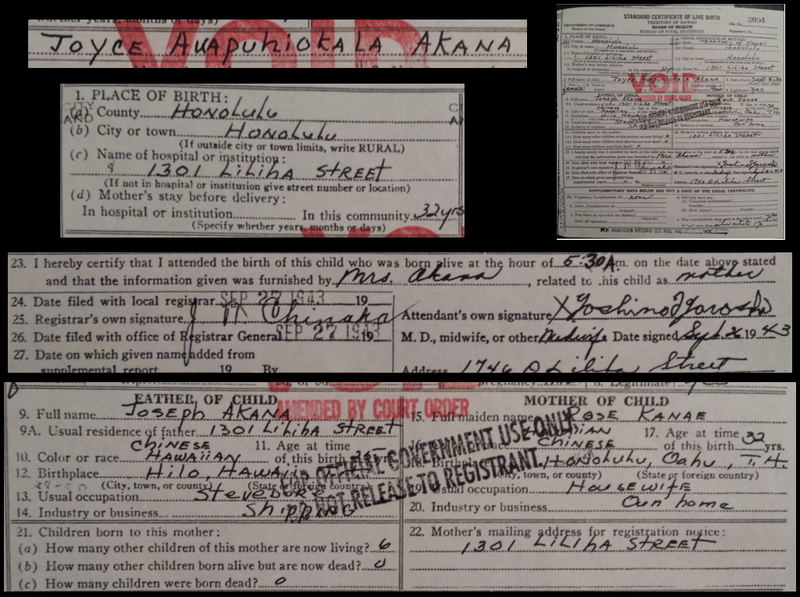 Joseph Akana’s surname was the only clue that made me believe he was not the biological father. I had even suspected that there may have been a question of paternity with Joseph Akana and what may have caused my mother to get adopted, hence Joseph divorcing and my grandmother remarrying. I was also told that back then, no matter which state, particularly for unwed mothers, if the biological mother knew who was going to adopt the child, she might take on the identity of that woman and check into the hospital as that person. 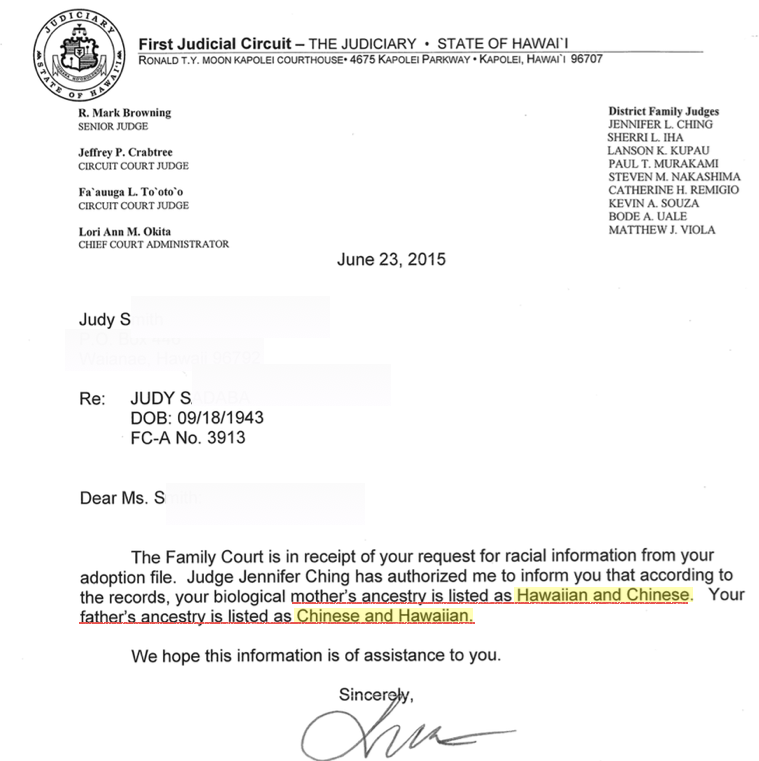 The woman who adopted my mother – Julia Kawewehi was Hawaiian and Chinese. So I assumed this is what happened unless Rose Kanae really did not know her ancestry. The DNA evidence indicates a near perfect 70% East Asian to 30% Oceanian component consistent of Polynesians4. Whereas those who have some Asian ancestry in addition to Polynesian, the percentage of East Asian to Oceanian would be much more significant than 70%. Therefore either the parents listed in the adoption files really are not her parents or they were just wrong with the ancestries of the parents. After getting more details on my maternal grandmother Rose Kanae’s branches, I was able to see exactly all of the foreign men who married Hawaiian women in her line. 1) Oliver Holmes, (later Hawaiianized to Oliva Homa) an American who arrived on the island of O’ahu in the Sandwich Isles on October 8, 1793 on board the Margaret, who was in service of the chief Kalanikupule. After Kalanikupule’s death in the Battle of Nu’uanu, Holmes married Mahi, the daughter of the high chief of Ko’olau5 whose name was Kalaniulumokuikekai6. After Kalanikupule was defeated by King Kamehameha, along with Mahi’s father Kalaniulumokuikekai, Oliver and others were taken by Kamehameha and became advisors for the King. In 1810 after King Kamehameha united all the islands, Oliver became the 3rd Governor of O’ahu. Governor Homa, as he was called, remained in Honolulu and had one son and five daughters. One of the daughters – Hannah Holmes married Captain William Heath Davis Sr, and their son William Heath Davis, Jr. ended up in California in San Francisco and was also one of the original founders of New Town San Diego7. Oliver’s other daughter Polly married Captain Isaiah Lewis and it was said that she traveled with him to the northwest coast. Oliver had three other daughters, all of whom married captains of ships coming into the Hawaiian islands. 2) Captain Isaiah Lewis, an American and son-in-law of Oliver Holmes. He commanded the Panther, and acquired sandalwood in Hawaii and sold it in Canton, China. He married Polly Holmes, the daughter of Oliver Holmes & Mahi. 3) William Ludlum, an American whaler from Jamaica, Queens, New York who became a citizen of the Hawaiian Kingdom on August 7, 1850. He married a Hawaiian woman named Ehu on January 24, 1850 in Mapulehu, Molokai. He ran a hotel & was a Commission Agent. 4) John Holbron [John Halborn/Holborn], originally from Hull, England arrived in the 1840s. He married a Hawaiian woman named Kama’u and became a citizen of the Hawaiian Kingdom on November 24, 1845. He was a merchant. After knowing for sure who these foreigners were, I was able to re-design that diagram and came up with new percentages of each ancestor. The light blue represents the male, the pink the female, and the bottom is my mother of which is calculated 14% European and 85% East Asian/Oceanian. My mother’s results fall into that range of 14% – 19.81% European and 80.18% – 85% East Asian/Oceanian. 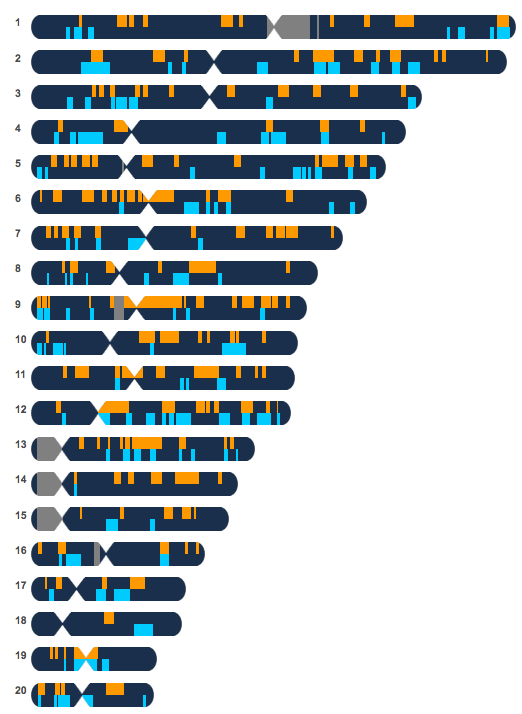 While my match at FTDNA did share 2 X segments with my mother (via her father of whom both of his parents were Hawaiian), the fact that I ignored it because of how unpredictable the X is lead me on the right path. The largest segment size is 10.2cM and the other is 8.8cM. I have seen how a significant amount of X my mother shares with other Polynesians (i.e. Samoans, Tongans & Maoris) can be so distant. While it can be useful in excluding certain branches, this is obviously not the case for endogamous groups, particularly not for Polynesians. Had I focused on the X path, I would not have made the connection at all. But it is not surprising that this male shares a distant X match with my mother on his mother’s side yet not have a recent tie to my mother on his maternal side, at least not that I have figured out just yet. My friend Charles Ano who have helped me with genealogy searches in the past decided to look up birth announcements in the newspaper around the time that my mother was born based on all of this information that I found. It listed her original name – Joyce Awapuhiokala (Akana). I did not want to reveal this to my mother just yet since I completed the last step of accessing her adoption records just the other week. I wanted my mother to receive copies of the actual adoption files and see for herself who they listed as her parents and her original name. Eventually my mother found out that I knew of her original name, and after I got a chance to speak to her about it, she told me that she already knew she was born Joyce and that she was related to the Akana family, and also had a Hawaiian name, but she did not know what that name was. She was about 9 years old when she found out about all of this. I did tell her that I remember her mentioning the surname – Akana. And I knew that when I found Joseph Akana, there was something about that name that seemed familiar but could not remember exactly. I later realized it was last year after almost giving up on DNA and before resorting to accessing her adoption files via the court, I had turned to the 1940 census, just three years before she was born and looked for the place where she was born. It was at that time I asked her about the family names, people who lived at that address where she was born to see if it seemed familiar. None did, but it was at that time when she asked, “what about Akana?” I never asked her much more about it, but remember she did comment about how she heard that was her family. Unfortunately, I forgot about this important clue. Now knowing my mother’s original name, I decided to seek out my cousins, children of my mother’s siblings. I already saw names of some of them based on the obituaries I found of my mother’s siblings. I first contacted a woman whose surname matched my mother’s brother and with whom I already had contact with because at the beginning of accessing my mother’s adoption files I simultaneously tried to get my original birth certificate since my adoption was done at another court. My adoption was a technical issue. The mother that I speak of is my biological mother. It turned out that this contact is a granddaughter of my mother’s brother. After sharing with her who my mother is, what name she was born, who her parents are and identifying the other siblings based on what I found in the obituaries, she notified both her grandfather and a sister living on another island. I sent photos of us and she shared it with her great-aunt and grandfather. She remarked at the strong resemblance of my mother and her great-aunt. At the same time, I found another cousin on Facebook, contacted our mutual friend and that friend revealed how this cousin probably knew my mother. Turns out that this cousin and my mother have known each other for the past 6 years. This cousin also told my mother at first meeting her 6 years ago that she reminded her of his aunt. This was the same person that the other woman commented of how my mother looked like her great-aunt. 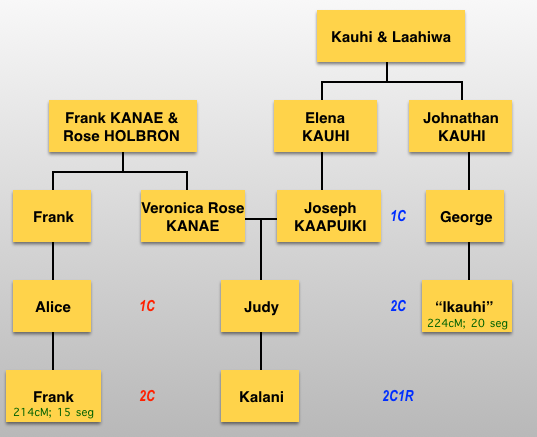 In a few days after having other cousins contacting me, they revealed the entire story of how our grandmother Rose Kanae married three times, and with her husband Joseph Akana she had four children. A daughter who carried the surname KALEI which was the surname of Rose’s first husband. Another daughter and of whom is the only sister to my mother that is alive, the one who we are told my mother looks like. Then a brother and finally my mother. Then with the last husband, Rose had two sons. The youngest is alive and whose granddaughter I first contacted. Only the sister that is still alive and one of the younger half-brothers were the only two children that were not given up for adoption. The other seven children were all given up for adoption. The older ones knew of my mother’s existence. But what they knew was that they had a sister named Joyce Akana who was given up for adoption by a Filipino family. My mother’s adoptive father was Filipino. Then it was revealed to me how Joseph Akana really was my mother’s father, but Akana is a surname he took on later in life and was the surname of his paternal aunt’s husband. His original name was Joseph Napua Kaapuiki and was a pure Hawaiian man just as my mother remembered. And Joseph did frequent the area and since my mother grew up right by where she was born, it is no surprise that she actually did encounter her father. And as difficult as this was given the situation with Polynesians and endogamy, it can still be done. It would just mean that every match, especially when it comes to geographic location should be scrutinized in order to determine a really close match or not. I was there on November 1, 2015 when my mother and her sister Stella got to meet each other. My mother Judy on the left, with Aunty Stella on the right. This blog entry was edited after new evidence confirmed my mother’s paternity and after she was reunited with her sister. 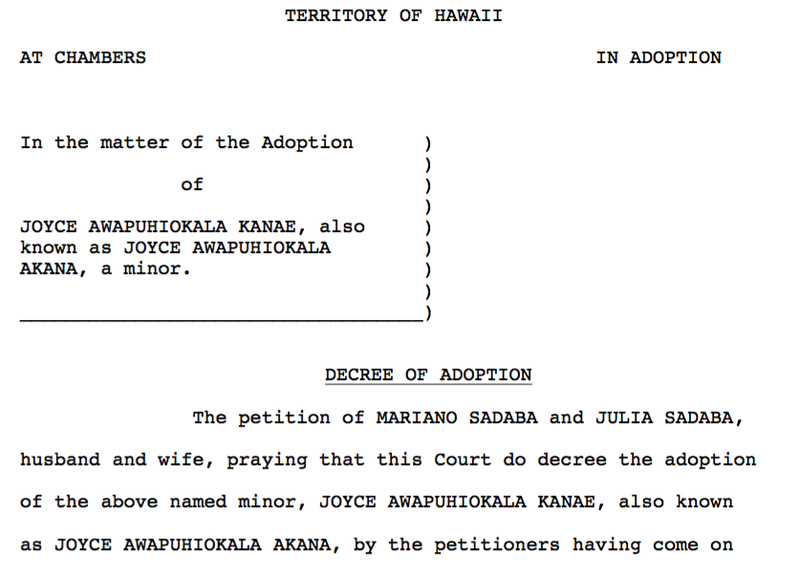 In May 2016 my mother received her adoption files which listed her biological parents as Joseph Akana and Rose Kanae, listing my mother’s name as Joyce Awapuhiokala Akana aka Joyce Awapuhiokala Kanae. 1. MyOrigins v1 May 2014 – April 2017. MyOrigins v2 separated the Oceanian from the East Asian and currently Oceanian falls under the broader Central/South Asia category. 2. Dr. Doug McDonald developed a the Biogeographical Analysis software and was contracted with Family Tree DNA to write the underlying code for their Population Finder ethnicity software. 3. Phylotree build 17 currently is B4a1a1c. 4. Population Genetic Structure and Origins of Native Hawaiians in the Multiethnic Cohort Study shows that autosomal results for Native Hawaiians consist of 68% Southeast Asian and 32% Melanesian components. 5. Day, A. Grove. (1984) History Makers of Hawaii. Honolulu: Mutual Publishing of Honolulu. pp. 53. 6. Honolulu Star-Bulletin – Monday, June 20, 1960: Tales About Hawaii – Oliver Holmes Founds a First Family. 7. William Health Davis, Jr.
My mother told me today that she received from the First District Circuit Court that handled her adoption, the non-indentifying form, which is where it lists her biological parents’ ancestries. They indicated that both parents are Hawaiian and Chinese. I find that to be an error since my mother had her DNA tested at 3 companies. Maybe that was based on an assumption or the biological parents may not have known too much about their ancestries. At the age of 5, she met her biological father and described him as a “pure Hawaiian.” This made sense since she gets the following percentages from each company. So this meant that one parent was just Hawaiian while the other parent was admixed with some European. 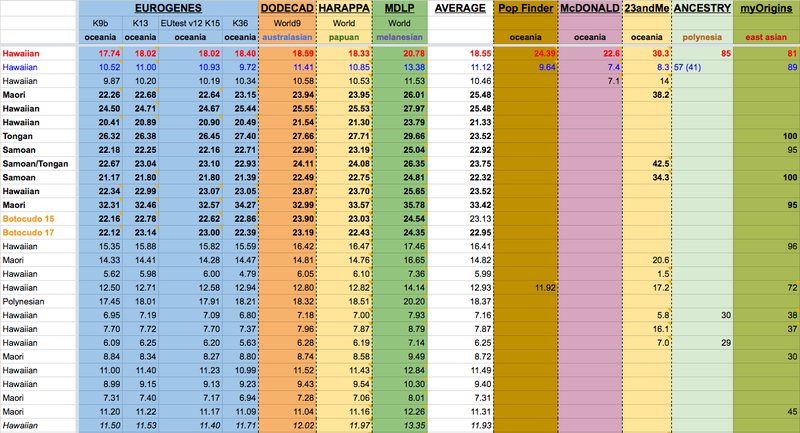 Based on all the companies she has tested with and analysis [from Dr. McDonald], my mother gets the following averages. 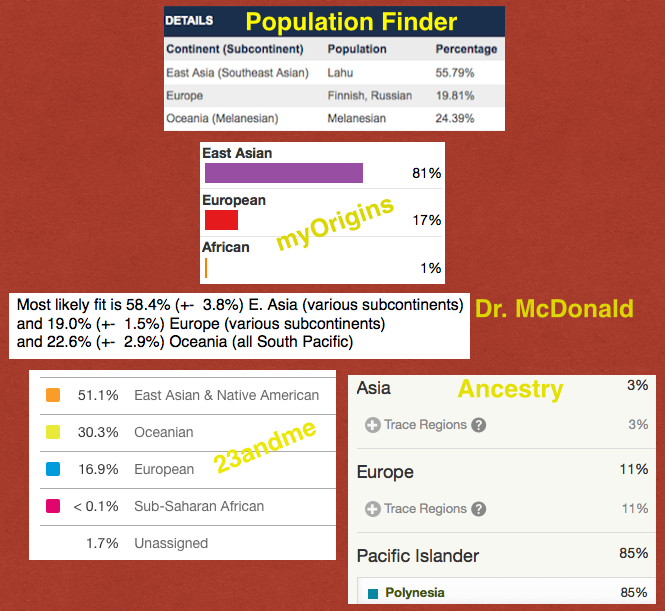 Those are based on 23andme, FTDNA’s old Population Finder and Dr. McDonald’s analysis. FTDNA’s current myOrigin lumped their former Oceania category under Southeast Asia, or the more broader East Asian category. AncestryDNA however created a Pacific Islander category with the subgroups Polynesia & Melanesia and between myOrigins and Ancestry, the average total is 83%. In reality, the East Asia category is just one of two components that make up the genome of Polynesians. The other is Melanesian/Papuan (Oceania). For Polynesians, autosomally they are 79% East Asian and 21% Melanesian1. So while other studies revealed that Polynesian genome consist of 79% Asian and 21% Melanesian components, the study with Hawaiians averaged 32% Melanesian and 68% East Asian2. The higher amount of Melanesian could be attributed to the repeated bottleneck effects throughout the centuries specifically for eastern Polynesians, i.e. French Polynesians, Rapa Nui, Cook Island Maoris, Maoris from New Zealand and Hawaiians. 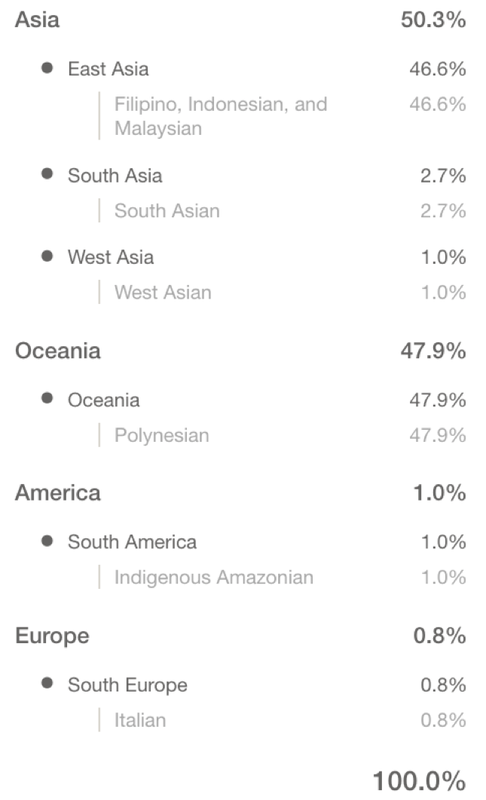 My mother averages 25% Oceanian and 55% East Asian. The two combined equals 80%. 25% (Oceanian) is 31% of the entire Polynesian (80%) percentage. Just over a year ago I was going through my mother’s matches on GEDmatch and began running their kits through various admixture tools to see their totals of Oceania versus East Asia. I wanted to see if they fell within the 27% to 32% Melanesian/Papuan/Oceanian. This is only a partial list. There are more lines on the bottom but I am just showing the first several. I use various calculator admixture tools at GEDmatch that had the specific Oceania/Papuan/Melanesian category. Dodecad World9 uses “Australian” instead. I created a column that totaled the average. And the columns to the right of that shows those who tested at other companies and their Oceania percentages. What is not shown in the list is the proportion of East Asian that would prove it does fall within the 27% – 32% Oceania. 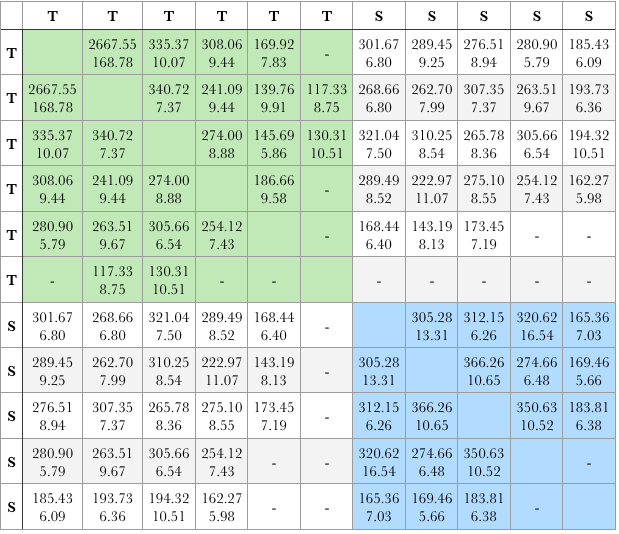 The first row (in red) belongs to my mother, followed by my averages and then my brother’s. The following lines in bold are for those at least 95% Polynesian. I took the lowest and the highest percentages of Oceanian to see if it falls within the range consistent with the research. Since these admixture calculators did not have just a single East Asia category alone, I listed the other categories that are known to split off from the East Asia category. Adding the Southeast Asian, Northeast Asian and Native American categories total 63.74%. 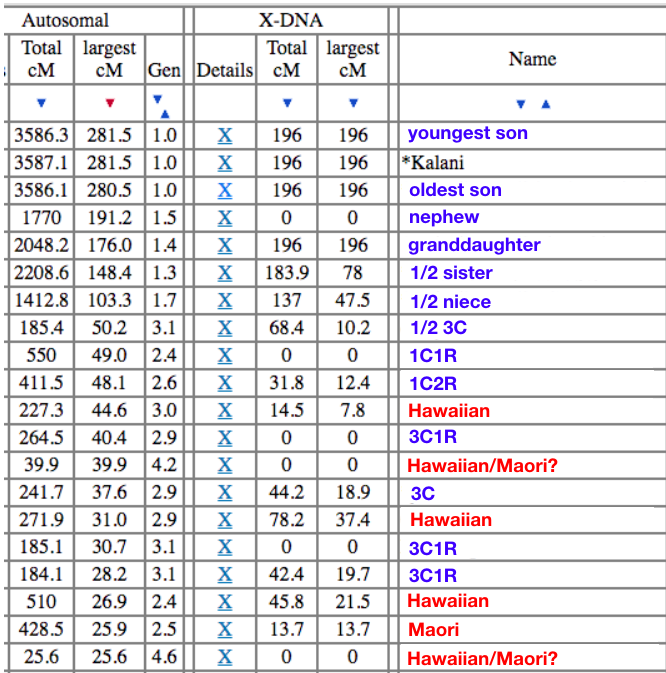 17.74% Oceanian makes up 27.8% of the total (East Asian compiled categories) of the Polynesian genome. Consistent with the research. Looking at the highest percentage. There was an Indian category showing 3.74%, but I did not add that in. Adding it, changed the overall percentage to 33%, but leaving it out made it 35.7% of the Polynesian portion. For the others listed on that list, they also picked up a small 1 – 3% of the Indian category, and leaving it out made their average 30%. If I look at the average column for all the admixture calculators for my mother, it comes out to 30%. But what happens when there is a higher percentage of East Asian? In my case, it is higher because my father was Filipino. My portion could easily be verified simply by removing 50% (my father’s contribution) from my average total of 85% East Asian giving me 35% East Asian that would be my Hawaiian/Polynesian side. My average (GEDmatch) showed 32%. There are many Hawaiians admixed with Chinese, Japanese, Filipino or Korean, being that they were all immigrant groups to the Hawaiian islands. Are you able to tell if they have an Asian admixture? Can it be distinguished from the East Asian that is part of the Polynesian genome? This is something I have been seeing more now particularly with adoptees. 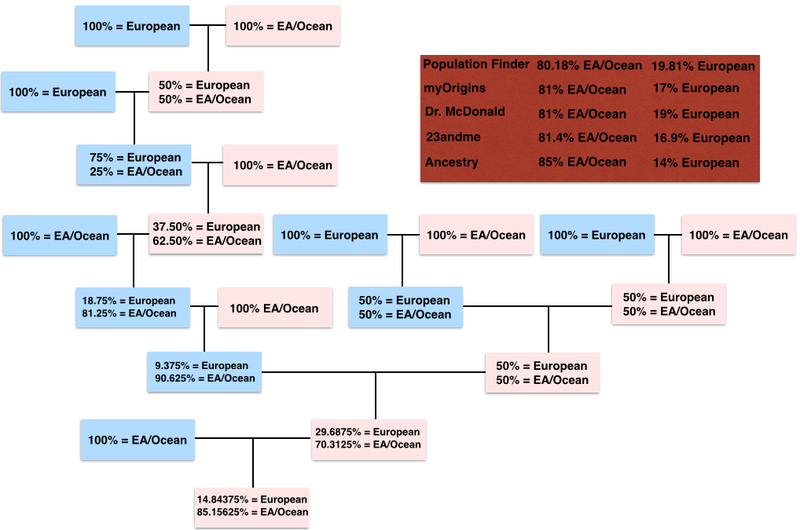 Any excess East Asian percentage compared to the Oceanian percentage [79% to 21%], would indicate that the person is admixed with some other Asian ancestry. Since my mother’s genome does not indicate any more East Asian than what it should for Polynesians, it is clear that she does not have any additional Asian ancestry. Felix Immanuel, a software professional at Hewlett-Packard based out of Canberra, Australia who has a Bachelor of Engineering in Computer Science and a Master of Science in Forensic Computing and Cyber Security from University of South Australia, has been uploading a bunch of ancient DNA to GEDmatch.com. The most recent uploads were samples taken from skulls of two extinct Botocudo (Brazil) men. I blogged about it in December 2014. At that time, they hypothesized a few ways how the Polynesian motif could have made it into the genome of these now extinct Botocudo tribe. But recently in Two ancient human genomes reveal Polynesian ancestry among the indigenous Botocudos of Brazil (http://www.ncbi.nlm.nih.gov/pubmed/25455029), they talk about the hypotheses again and how they came to the conclusion that these samples are definitely Polynesian. The two male individual samples used, known as Bot15 and Bot17, presented a combination of mitochondrial DNA (mtDNA) variants common in present day Oceanian populations. They pointed out a few hypotheses that was mentioned in the other paper, and that “the 1862-1864 AD Peru-Polynesia slave trade can be excluded, given that the 14C calibrated dates for the skulls predate the beginning of this trade.” Because these skulls have been radiocarbon dated, the dates that they came up for Bot15 was 1479 – 1708 AD and 1730 – 1804 AD, and for Bot17 was 1496 – 1842 AD. So the fact that the Peru-Polynesia slave trade occurred after the death of these people excluded the hypothesis that Polynesians were brought over during that slave trade. Also, the Madagascar-Brazil slave trade hypothesis has been excluded due to the recent genomic data that demonstrated that the Malagasy ancestors admixed with African populations prior to the slave trade, and no such ancestry is detected in the Botocudo sample. Madagascar was peopled by Southeast Asian and not Polynesian populations. And finally, trade involving Euroamerican ships in the Pacific only began after 1760 AD. By 1760 AD, both Bot15 and Bot17 were already deceased with a probability of 0.92 and 0.81, respectively, making this scenario unlikely. These two samples analyzed had no Native American component detected. Felix was able to extract SNPs from the raw data to come up with C-PH3092, and C-Z31878, which are Melanesian in origin and the C haplogroup is common in eastern Polynesia. The mtDNA haplogroups were B4a1a1a and B4a1a1. B4a1a1a is pretty common throughout Polynesia especially in eastern Polynesia. And most importantly these samples are a match only to eastern Polynesians. There is no doubt that these particular samples are Polynesians. Question is, how did they get there? Did they manage to produce offspring with the local Botocudo groups like the Crenaques, Nac-Nuc, Minia-Jirunas, Gutcraques, Nac-Reques, Pancas, Manhangiréns or Incutcrás? Or did they have offspring but they never survived? Were these samples that were found the actual people who traveled directly from Polynesia? Or did they arrive as a group and intermarried within their own group of Polynesians but later were found among the other Botocudo people? And why travel thousands of miles over mountains and crossing rivers, possibly going through or bypassing the Pantanal that borders Bolivia and Brazil and continue to head towards the east? We have other evidence like the kumara [sweet potato] or ‘uala [Hawaiian word for sweet potato] that originated from South America, and not to mention our many oral traditions of all the famous travelers who went abroad to Kahiki [foreign lands; Tahiti] and towards ka hikina [the east] where the rising of the sun is. Travelers like Kuali’i, Hema, Kaha’i, Wahieloa, Laka and Luanu’u. Now DNA is showing the scientific community what we have known based on our oral traditions. 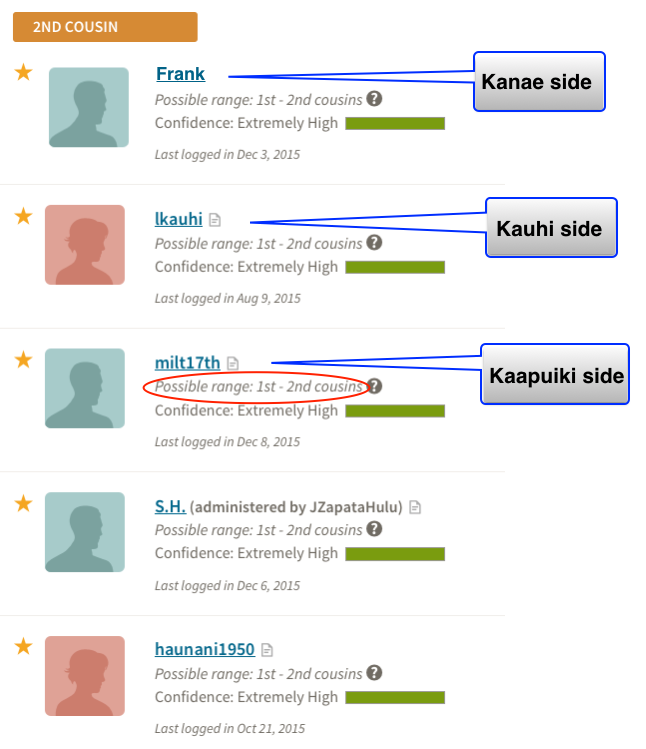 Now that Felix uploaded both of these samples up on GEDmatch.com, we see that both of the samples matches a few of us [both admixed and non-admixed] Hawaiians (including my mother), Maori, and a Cook Island Maori. No surprise that eastern Polynesians are a match, given how they lack genetic diversity much more than the older western Polynesians. But it may also suggest, if not confirm, that it was specifically part of the expansion of eastern Polynesians. But was there another expansion that late in the 1600s? Another not so surprising thing about these matches is that there may be small segment matches, but when utilizing GEDmatch’s graph when comparing ONE TO ONE, we can still see small segments of full identical region for a few of these matches. Also the supplemental information can be accessed here. Last December I blogged an entry entitled Polynesia Category – Ancestry.com. It was about their new Pacific Islander category and how I noticed Filipinos had been coming up with that category as well. I have been noticing other people of mainly Southeast Asian ancestry having small percentages of Polynesia in their ancestry composition. A Taiwanese aboriginal would have about the same amount as Filipinos, ranging around 25% – 29%. A friend that I know whose mother is a Taiwanese aboriginal and he got DNA tested came up with 13% Polynesia and 37% Asia East. That is nearly identical to what half Filipinos would get. A Taiwanese person who has Fujian ties centuries ago and is not a Taiwanese aboriginal showed up having 8% Polynesia and 92% Asia East. Another friend whose mother is from the Moluccas (Indonesia) and tested himself came up with 19% Melanesia, 12% Polynesia and 17% Asia East. I have had three Chinese people who got tested with Ancestry.com and told me that they also had Polynesia show up within the 10% – 11% range. All of these are the results of picking up that Southeast Asian component that exists for these people including Polynesians, of which makes up about 80% of their genome. A few weeks ago I spoke to Ross E. Curtis, Ph.D., a computational biologist, specializing in genetics and visual analytics, and has been with Ancestry.com since 2012. I informed him of the small sampling size that they had, just 18 samples (see Polynesia Category – Ancestry.com) and the problem that provided. He was not too familiar with the details behind, mentioned a colleague that helped to put that category together but was unable to provide any real insight into that specific category. So whatever I am learning about this comes from actual testees and especially those who are not of Polynesian ancestry. My mother finally did test with Ancestry.com back in March when I made an emergency trip to Wai’anae, O’ahu, Hawai’i and had my mother retake that test since it got rejected. I had predicted that she would basically show up as 80% Polynesia and 20% European, but this is her actual results. It is as almost that Ancestry tends to give us the lowest possible amount of European. I got 8% while my mother got 11%. 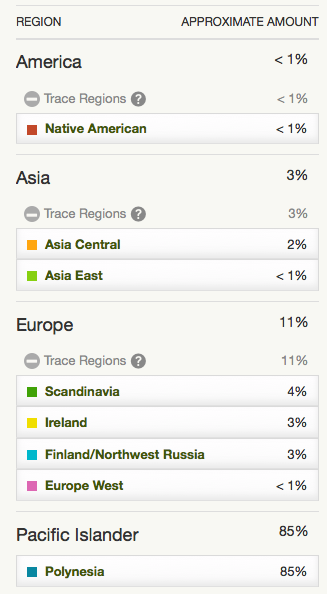 And just as it did with FTDNA’s myOrigins, it gave my mother a bit more Scandinavian. Actually with myOrigins my mother gets 19% while I show 11% Scandinavia. We will probably see more people of Southeast Asian origin come up with the Pacific Islander/Polynesia/Melanesia category as a proxy for Southeast Asian as more get tested. No surprise however when I looked at her matches, a lot of close 2nd – 3rd cousin matches. 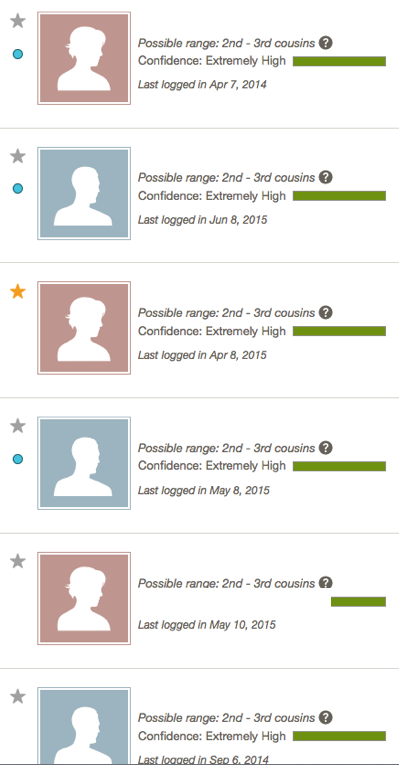 My mother has three 1st – 2nd cousin matches, Extremely High confidence. But for the 2nd – 3rd cousin range, she has sixty-seven matches, Extremely High confidence and a total of two-hundred sixty-seven matches for 3rd – 4th cousins, all Extremely High confidence as well. Others not familiar with Polynesian endogamy, or endogamy in general insisted that these close matches have to be actual close matches. I managed to match two of my mother’s 2nd – 3rd cousin matches on GEDmatch.com. Assuming that the matches are listed in order of closest to the least closest, these are how the two matches up with my mother. These are one of the few larger segment matches that she has while most rarely go up to 15cM. Something common with endogamous groups. Only uploading to GEDmatch can it be clear if the 2nd – 3rd cousin matches are real 2nd – 3rd cousin matches, or an endogamous ones that has numerous segments rarely going higher than 15cM for the largest segment. 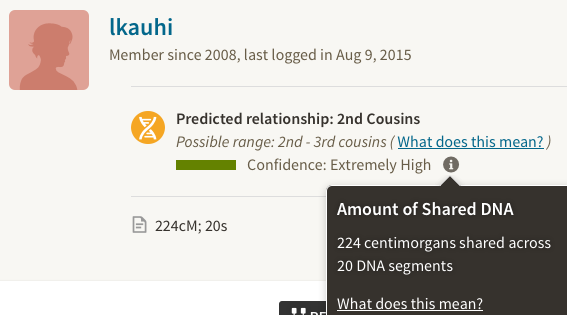 Other than that, any Polynesian testing at Ancestry cannot assume that the 1st – 2nd or 2nd – 3rd cousin matches are actually that close as estimated. 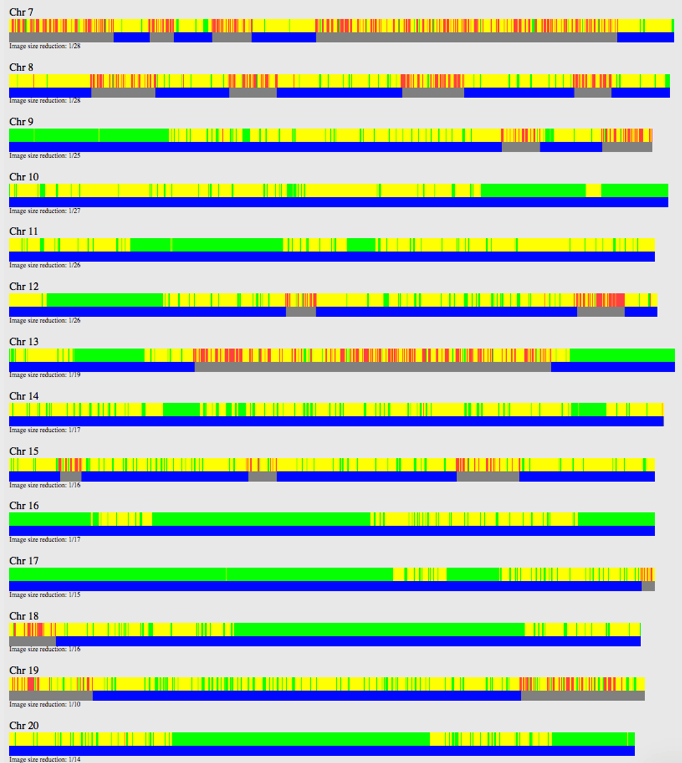 In my last blog entry “Tiny Segments from the Same Common Ancestors“, I began comparing Western Polynesians (Samoans & Tongans), and Eastern Polynesians (Maori and Hawaiians), and compared them to each other in order to show how the tiny segments appeared like missing teeth on the chromosome browser. 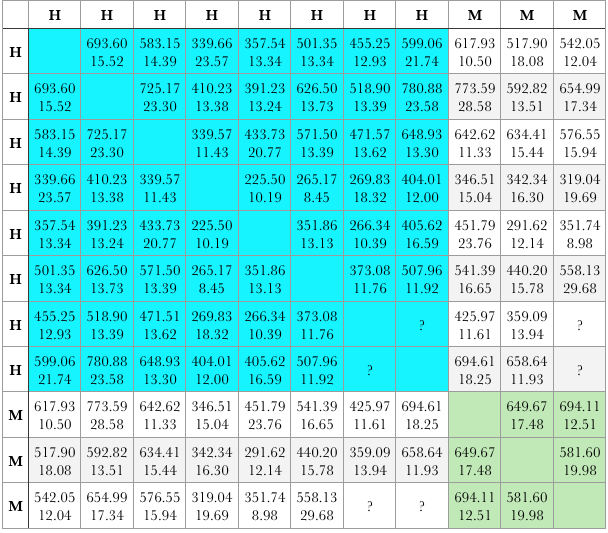 Now I will show how people compare to each other based on total centimorgans and their longest block (FTDNA). I colored it to make it easier to see or compare Tongans to Tongans in light green, and Samoans to Samoans in light blue. The ones not colored are comparing Samoans to Tongans. The top number is the total shared in centimorgans, while the bottom number is the longest block (largest segment). The average totals seem to be between the upper 200s to mid-300s. The lower numbers (in the hundreds) is due to the fact that the person is admixed. In other words, they are not pure Samoan/Tongan, and usually have some European ancestry. This is what it looks like when I compare those same Tongans and Samoans to Hawaiians and Maoris who are Eastern Polynesians. In this graph, I again colored it for easy comparison. Hawaiian vs. Tongans in light brown, Hawaiians vs. Samoans in golden yellow, Maoris vs. Tongans in pink, and Maoris vs. Samoans in light green. Most of the Eastern Polynesians are admixed except for two Hawaiians and one Maori. But those that are admixed are still more than 75% Polynesian which still keeps the totals fairly high as you can clearly see it still above one hundred with the exception of one Hawaiian who is admixed to the Tongan that is admixed. In fact, that admixed Tongan only shares with one Hawaiian and one Maori, both less than 100cM. Yet their longest block still falls within the range. When looking at the average, it seems to be consistent as far as comparing Eastern Polynesians to any Western Polynesian. However that changes drastically when comparing Eastern Polynesians to themselves. I colored Hawaiians in light blue and Maoris in light green when comparing to themselves. The non-colored portion is when they one group is compared to the other. 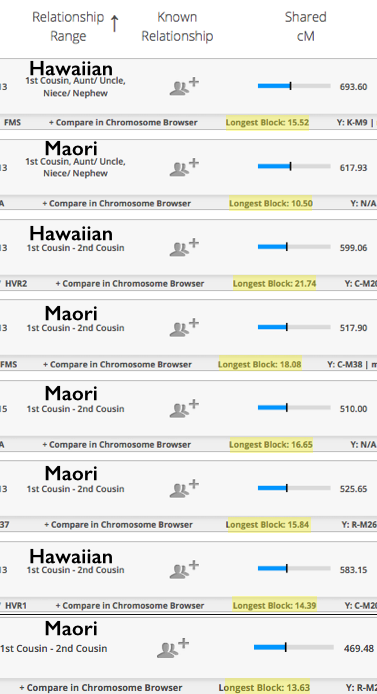 Although I used only 3 Maoris compared to 8 Hawaiians, it was based on the top matches to my mother. There were a few more Maoris but I did not have access to their data and that would have allowed more “?” in the charts. But as we can see, the Western Polynesians tend to have lower totals since they are more diverse unlike the Eastern Polynesians. More admixed Polynesians will result in lower totals, but the longest block is not that much difference from those not admixed. In the future I will probably attempt to look at admixed Polynesians and compare them to show the average longest block sizes compared to those not admixed. Disclaimer: This post demonstrates the use of 1+cM when comparing specific groups of people in order to see patterns of multiple descent from a few ancestors. It should not be used to validate connections with matches, particularly in this example where connections are beyond a genealogical time frame reaching at least up to 500 years. Recently I have been comparing both western Polynesian (Tongan and Samoan) and eastern Polynesian (Hawaiian and Maori) matches. I compared western Polynesians among themselves, and did the same thing with eastern Polynesians comparing them among themselves. Then I compared the two groups to each other. To those who are not familiar with Polynesian origins and/or are new to reading my blog, I will recap. The ancestors of Polynesians originated from the Melanesia area and thrived there for thousands of years. Thousands of years later a group of “Austronesians” originating from Southeast Asia moved into the area, intermingled briefly and continued to move into western Polynesia where Polynesian culture was born. At least a couple of thousand of years would pass before they would continue to expand further eastward. As Polynesians moved from west to east, their genome became less diverse due to repeated founder’s effects and bottle necking. I analyzed my mother’s results and compared her to a Hawaiian (orange), and a Maori (blue) below. The Hawaiian is her top match, sharing a total of 693.60cM, longest block 15.52cM, consisting of 158 segments. The Maori is her 4th top match sharing a total of 517.90cM, longest block 18.08cM, consisting of 119 segments. FTDNA counts all the tiny segments as low as 1cM once the criteria of a match is met, which is why the number of segments is high. With the default at 5+cM I did not see anything unusual other than ordinary small segment matches. But when I reduced the setting down to 1+cM (above), you can see a lot of tiny segments resembling a comb. The slightly bigger gaps are just the missing teeth of a comb. Some of these patterns begin to appear at 3+cM, although most do not appear until you reduce it down to 1+cM. In my mother’s example above I show only chromosomes 1 – 20 since there were no segments that looked like a comb on the other chromosomes. Then I looked at a Maori woman’s results (below) and compared hers to other Maoris and one Hawaiian. She also shows the missing teeth at 1+cM, but only in a few areas. Some areas have the comb pattern while other areas seem random. The random segments could be IBS (Identical by State) or IBD (Identical by Descent). Polynesians lack genetic diversity, particularly eastern Polynesians more than western Polynesians, so the random looking segments could be both IBS and IBD segments. Then I looked at two Tongan men and compared them to other Tongans and Samoans. With Tongans & Samoans there seem to be more randomness. A few of the tiniest segments may be close to each other, but nothing resembling too much like my mother’s results, a definite comb-pattern. Take the purple and green colors for example for this one Tongan man below. Notice how on some chromosomes they seem to be closer together while on others it just looks random. Again, these are only using the bare minimum 1+cM. As you can see, it is hard to look for patterns that resembles a comb, and instead you see random colors all over the chromosomes. What was interesting to see was how little X these Tongans had. Unlike with the Maoris and Hawaiians, many of them shared multiple segments with each other. But what does all of this mean? These are very small island populations. They have had repeated emigration from these small islands that resulted in a series of founder’s population. There there was also bottle necking that occurred a few times. All of these combined would leave only a few closely related ancestors to populate and repopulate new areas every time. So the multiple, very small segments that represents a comb with missing teeth is the result of people descending from just a few ancestors who contributed that particular segment, but was inherited from multiple lines going back to the same ancestor over and over again. 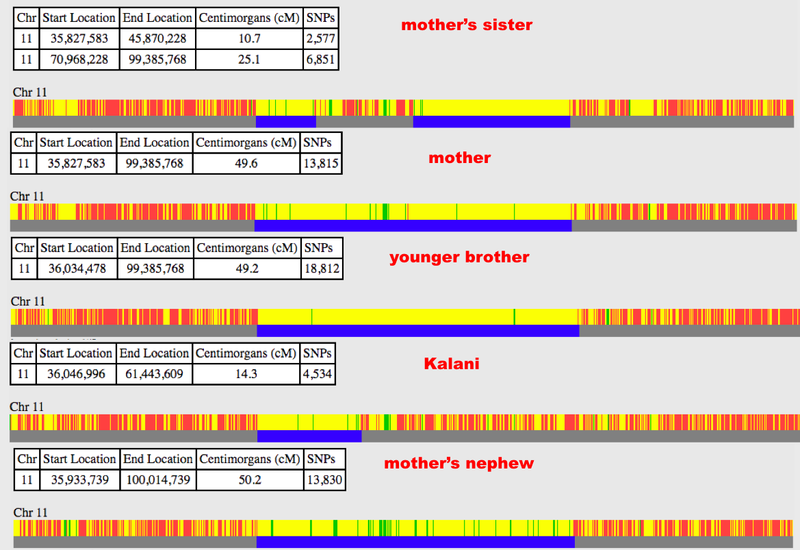 Below is an image where I compare my mother with two Samoans (yellow & green) and three Tongans (orange, blue & purple). There seems to be more randomness, however, there are a few of those comb patterns. Notice how the X chromosome is much more full, unlike what we saw when comparing the western Polynesians (Tongans & Samoans) among themselves. The yellow color belongs to a Samoan woman. The fact that women have 2 X chromosomes may be the reason why there is a long match versus using two Tongan men whose matches included two women in their examples above. But these are Polynesians, so you would expect more of a match on the X. My observance of matches for the past 2 years was limited to only my mother being compared to others, which means I have seen a lot of X matches for her, and the same for myself and my brother. From what I am noticing so far is that these patterns look like what is mentioned in research papers about Polynesian genome and the loss of heterozygosity going from west to east. The last place in Polynesia to be settled was in the east, ending at the extreme points of the Polynesian triangle, namely Rapa Nui (Easter Island) in the south east, Aotearoa (New Zealand) to the south west, and the Hawaiian islands in the north. This explains why my mother and the Maori woman have less random looking tiny segments compared to the Tongans and Samoans. And if we compare western and eastern Polynesians to each other, we may see some randomness but not as much as we would see with western Polynesians alone. Other types of Polynesians getting DNA tested would help to exhibit any other additional patterns that I cannot currently see with the majority of Hawaiians and Maoris getting tested. Genetic research on Polynesians will frequently mention the loss of heterozygosity. This is more noticeable when comparing eastern Polynesians to western Polynesians. Polynesian populations are relatively homogenous both phenotypically and genetically. Over a span of 3,200 years they moved throughout the Pacific, and unlike in Europe and other large continents, they did not mix with other populations due to isolation. These small founder populations have experienced several bottleneck effects, which further caused this loss of heterozygosity ending with the settlement of eastern Polynesia. Polynesians’ lack of genetic diversity is less evident in western Polynesia where initial settlement began. Hawai’i, New Zealand and Easter Island are considered to be eastern Polynesia, and these places were the last places of Polynesia to be settled. Recently I have been able to look at the autosomal matches among Samoans and Tongans of western Polynesia. Previously, I have been only studying Hawaiian matches and noticed that top matches were both Hawaiians and Maori people. Looking at Samoans and Tongans was very interesting as I now could compare the two different regions. My mother is 80% Hawaiian, while I am 40%. And as admixed as I am, I still get 1st – 3rd cousin predictions on Family Tree DNA (FTDNA), while on 23andme I get 2nd cousin and 3rd to distant cousin predictions. 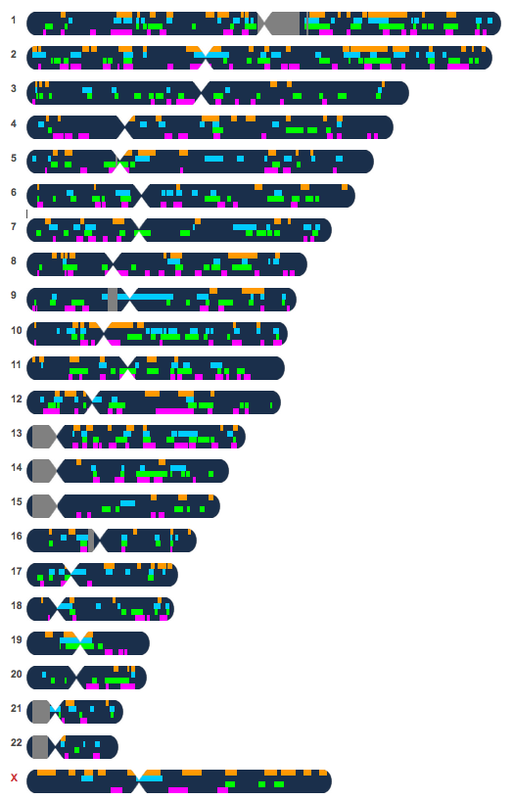 The centimorgan totals that I show with my matches reach as high as 369cM on FTDNA, and 161cM on 23andme. For my mother, 693cM on FTDNA and 376cM on 23andme. I see the same happening with Maoris, ranging between 300cM – 700cM (FTDNA) for the top 20 people. And for a non-admixed Hawaiian, their top matches are in the 600 – 700cM range. An admixed Polynesian would logically have lower totals. But even an admixed person can still have a fairly high amount of totals shared, as when I am comparing myself being less than half Hawaiian. When comparing two Tongans, the highest that they shared was 335cM. A Samoan compared to another Samoan was 366cM. And both of these Tongans and Samoans had their remaining top matches in the range of 100cM to 200cM. Many of their matches are the same Hawaiians and Maori that match each other at a much higher total. It is amazing to see these autosomal matches and how diverse the western Polynesians are, or rather how Hawaiians and Maoris are not as diverse. And even if it is an admixed Hawaiian or Maori, the matches to each other are still pretty high, and as high as what non-admixed western Polynesians would have to each other. When comparing the longest block (largest segment) with Tongans and Samoans, they seem to rarely get close to 15cM, averaging around 10cM. Anything more than that could indicate a possible closer relationship or perhaps a specific common geographic origin. The Hawaiians and Maoris usually range between 10cM – 15cM for the largest segment, but can go as high as 28cM which is usually in admixed Hawaiians and Maoris compared to each other. In other words, all Polynesians in general will have high totals exceeding 100cM, but whose largest segment rarely exceeding 10cM. I look forward to more western Polynesians getting tested so we can see if there is any pattern to specific islands in their own island group, something I have been trying to do with Hawaiians with the few haplogroups that there are for Polynesians. What also needs to be analyzed are people from Tahiti and the Marquesas being that they were key dispersal points for eastern Polynesians. I managed to only see the results of one admixed Tahitian woman and her match totals are identical to mine when comparing totals. I am curious to find out what non-admixed Tahitians will show, if it is more identical to eastern Polynesians, or to western Polynesians. Kitty Cooper put out a blog post where she entitled it What Can the X Chromosome Tell Us About the Importance of Small Segments? by Kathy Johnson. Kathy Johnson had gone through the males in her project and began analyzing and compared to females, determining how much of the females were producing false positives vs. the men. Because not many men would get a lot of X-matches. This seems to be an ongoing investigation with various people blogging about the validity of phasing, or rather how effective if not necessarily is it to weed out any false positive matches. 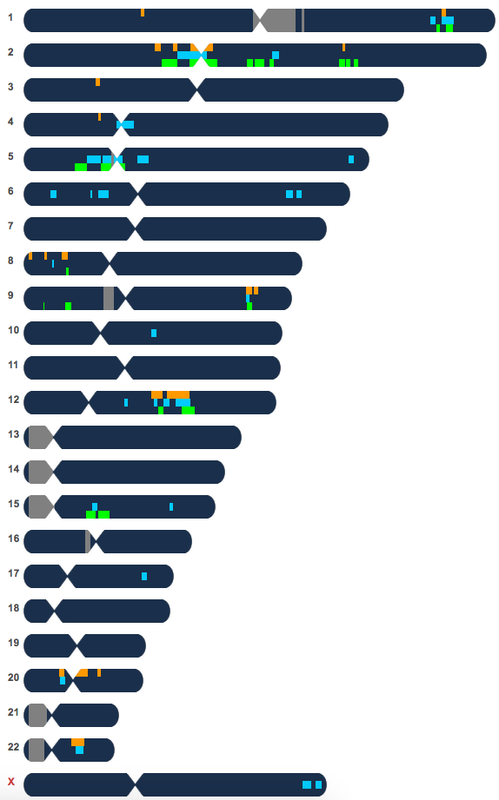 It seems to be based on FamilyTreeDNA’s X-matches where they include many tiny segments as little as 1cM. And the more substantial matches with 10cM or more tends to reduce the actual X-matches significantly, which would be due to the lack of phasing. You can read more about it on Kitty’s blog, although most of the discussion about evaluating all of these matches took place outside of the blog and on Facebook’s “International Society of Genetic Genealogy” page. That made me curious, because others have expressed how some men had little to no X-matches. This was not my situation at all , and went through my list of 9 pages on FTDNA and counted 47 X-matches out of the total 89 matches that I have. I noticed that one of them was actually an X match on my father’s side of matches, a Filipino. I knew that was wrong. So when I looked at it, no X match showed up in the chromosome browser until I reduced the threshold down to 1+cM where I saw a 1.9cM, a false match. Aside from one woman mislabeled as a male in my matches, I actually have 20 men and 26 females as X-matches, not counting that Filipino false match. That’s half of my matches. My mother has 93 X-matches out of her 159 matches, so not that much more than me. Could that indicate that my mother’s X-matches are more, or less of false matches? It’s an interesting idea to see how men can have less false matches but we are looking at Polynesian matches which just adds something else to it. 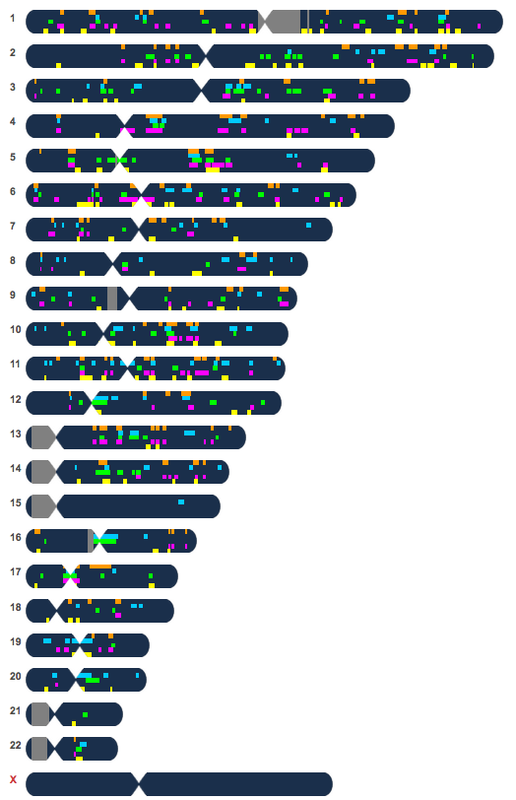 I know that I do have a lot of my matches below 5cM on the X chromosome, so I used dnagedcom.com’s ADSA (autosomal DNA segment analyzer) to at least look at my ICW (in common with) matches on the X, but I had increased the threshold to 700SNPs and 10cM. I was thinking that not only would it be easier to use this tool by instantly seeing my X-matches above a specific threshold, but it would also compare me with others with whom we share the same segments, therefore decreasing the chances of false matches. But taking into consideration that we are referring to Polynesians. How would that affect it really? I cannot determine from comparing my own to my mother’s X-matches if they would be false matches or not. Our problem, lack of documentation, lack of genetic diversity and the unpredictability of the X chromosome itself just to mention a few. I have recently begun testing my first cousins on my non-Hawaiian side in order to take a closer look at the X chromosome and how that is passed on knowing the X path, that is how it is passed on unrecombined from father to daughter versus mother to children. I also felt that knowing how it is passed on, it would be easier to distinguish which part of the chromosome was inherited from my grandfather versus my grandmother. And not until I begin testing relatives from each of my grandparents’ side, I will not be able to fully distinguish all of them with the rest of the other 22 pairs of chromosomes. Having said that, I cannot see how these X-matches, at least among Polynesians would be consist of a lot of false segments or not. Especially when there are long segments with the more distant people, e.g., Maoris or Samoans and Tongans, of which I do have X matches with. But the Samoans and Tongans are not included in the ICW due to the fact that I increased the threshold to exclude anything below 10cM. 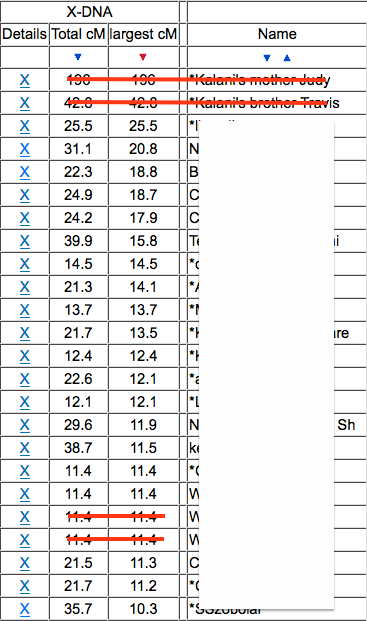 I also used Gedmatch’s ONE TO MANY to get all my matches, sorted them by the largest segment on the X and just looked at how many were above 10cM. There were only 20. I did the same for my brother, he got 17 above 10cM. I also looked at other Polynesian men just to compare and the numbers varied, usually not exceeding 20 with 10cM minimum threshold. It is still all interesting although it is hard to decipher how much of it is true for Polynesians. 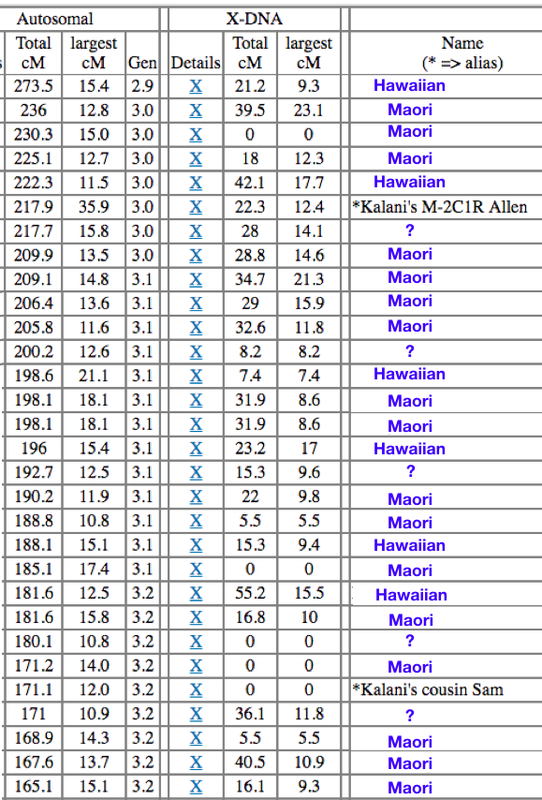 Hopefully as more Polynesians get tested, we will start to notice more differences, or confirm that we just all have a high amount of X-matches. Earlier this year I tested with Ancestry.com (or AncestryDNA.com) since I’ve been noticing non-Polynesians coming up with this new category. This is way after the fact the research does not specify a Polynesia component, but rather a Melanesian and Asian or East Asian or Southeast Asian component. I have seen other Asians, specifically Filipinos coming up with decent amount of this Polynesia category, as well as those of European descent coming up with small traces of Polynesia. 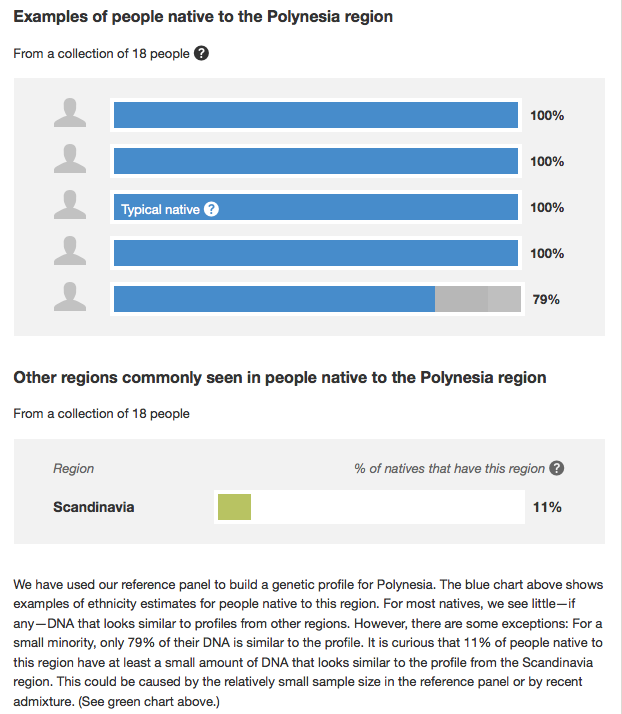 Under their Polynesia category, it mentions the sampling size was 18, and that one of the samples showed 11% Scandinavian. A larger sampling size would yield better results especially in this case where one of the 18 samples had some European admixture. This was enough to cause those with Scandinavian ancestry to come up with small traces of Polynesia, and in return cause people to wonder how they could have ever had such ancestry in their lineage to a point where some people create possible scenarios how they could have inherited this less than 0.1% Polynesia. Their Polynesia category was one of those categories where they had the least amount of samples. After receiving my results, as I suspected due to the fact that I am half Filipino, my percentage of the Polynesia category was pretty inflated. It showed that I had 57% Polynesia versus 34% Asia East. Knowing that my mother is 80% Hawaiian, and that my father was pure Filipino, I figured the amount of Asia that I showed 34% was missing 16% that was thrown into the Polynesia category. That would in turn leave me with 41% Polynesia. My mother is 20% European, and according to Ancestry I am 8% Europe, which seems to be about right. The other DNA companies I tested at showed more than 10% Europe. But adding the 41% plus the 8% comes out about right, 49%. Recently I had a cousin on my father’s side of the family test, and she got her results. She too is half Filipino, while her other half is completely Europe. I expected her to show some Polynesia but I did not even guess how much that would be. I was surprised to see 16% Polynesia for her, which is the same amount I had deducted from my own. In fact, she shows 33% Asia while I show 34% Asia, and more specifically we both share 31% Asia East. So they both are consistent. Although my mother was given an AncestryDNA kit, she has yet to take it. But I can easily guess that she will easily show 20% Europe and 80% Polynesia. Any other person who is Polynesian but admixed with some other Asian it may include part of their Asian component into Polynesia. Maybe the fact that we are Filipinos and they have ancestral ties is why some of it is classified as such. I did have another paternal cousin tested, she is half Filipino and half Japanese so not sure what type of results that will yield with the Polynesia category. Will it be the same and show her as 16% Polynesia? Or will it give her more due to her Japanese ancestry, or is that different enough to not be classified under the Polynesia category? 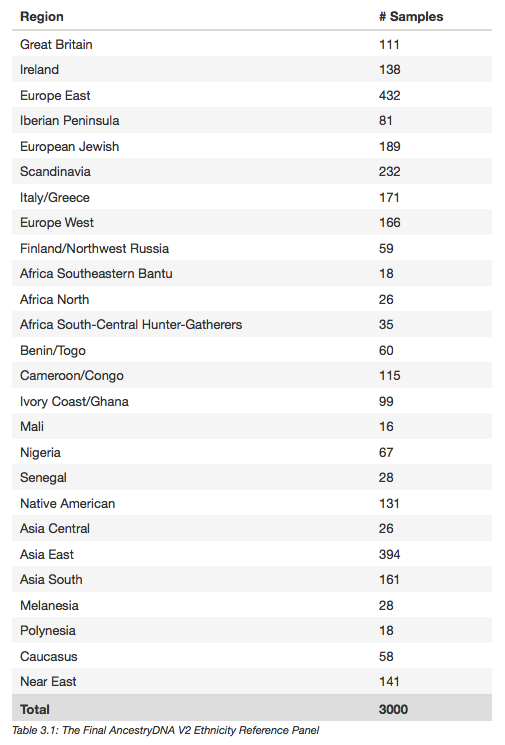 To find out more about AncestryDNA’s ethnicity/ancestry categories, you can read through their Ethnicity Estimate White Paper. Back in mid-September Roberta Estes had a blog entry Native American Mitochondrial Haplogroups. It’s basically a list of mitochondrial haplogroups that exists among Native Americans. But what caught my eye was the Polynesian motif – B4a1a1. She wrote, “B4a1a1 – found in skeletal remains of the now extinct Botocudos (Aimores) Indians of Brazil, thought to perhaps have arrived from Polynesia via the slave trade. This haplogroup is found in 20% of the mtDNA of Madagascar. Goncalves 2013” and “B4a1a1a – found in skeletal remains of the now extinct Botocudos (Aimores) Indians of Brazil, thought to perhaps have arrived from Polynesia via the slave trade. This haplogroup is found in 20% of the mtDNA of Madagascar. Goncalves 2013.” And although there is the actual research out there, it started with an article back in April 2013 titled, “DNA study links indigenous Brazilians to Polynesians.” Although the article’s title itself only mentions a link, it can be confusing to the reader and can be misleading once you begin reading through it. The article quoted Lisa Matisoo-Smith, a molecular anthropologist at the University of Otago in Dunedin, New Zealand where she said, “But to call that haplogroup Polynesian is a bit of a misnomer,” since the haplogroup is known to be in populations as far west as in Madagascar. The actual research can be found here, Identification of Polynesian mtDNA haplogroups in remains of Botocudo Amerindians from Brazil. It basically says that “Here we report the identification of mitochondrial sequences belonging to haplogroups characteristic of Polynesians in DNA extracted from ancient skulls of the now extinct Botocudo Indians from Brazil.” She does not seem to have been referring to the actual Polynesian motif but the fact that the research cited the mutations that is defined as the Polynesian motif. What is interesting to note is that is it not certain that these two skulls that they have analyzed were actual Polynesians or not. That is due to the fact that there was never a full sequencing test done on those two skulls that came up with the mutations that indicate the Polynesian motif. Instead, only HVR1, HVR2 and typed specific mutations on the coding region were sequenced. The findings mention specifically: 6719C, 15746G, 14022G and 12239T. 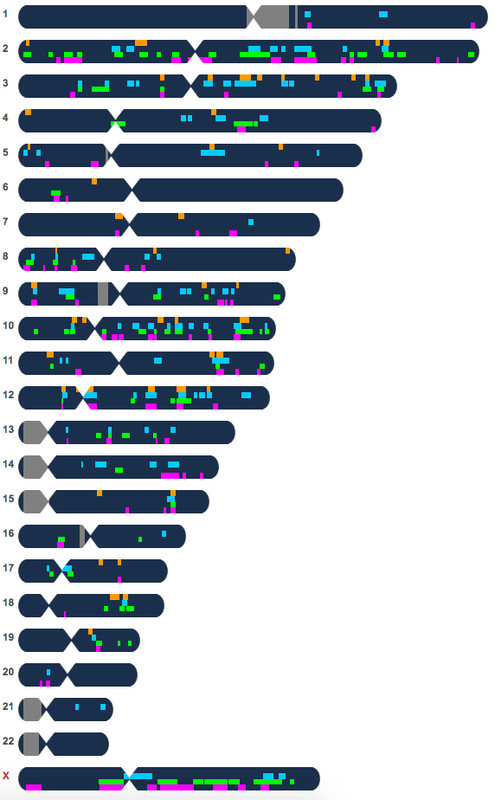 These specific mutations on the coding region not only exists in my own mtDNA results (B4a1a1a3, now known as B4a1a1c) but so does a friend of mine who is identified as having the Malagasy motif. The paper already mentioned how these two skulls could have come back with such a haplogroup is possibly through the slave trade, originally from Madagascar. And there were trips originating from Madagascar that eventually took these slaves into Brazil. So the real question is were these two skulls the result of that recent slave trade originating from Madagascar, or did somehow a very few handful of Polynesians made their way all the way to Brazil? The Botocudos lived in the interior portion of the state of Minas Gerais, so very far from the Pacific Ocean. Lisa Matisoo-Smith said it best, that to call that haplogroup Polynesian is a bit of a misnomer, particularly because we know it also exists in the Philippines and the subgroup – B4a1a1b (Malagasy motif) is in Madagascar. Until a full sequencing test is done, there still may be some debate as to whether or not Polynesians have gone that far into the interior of South America, or that these skulls were the descendants of Malagasy brought over during the slave trade. Largest Segment - Is it the best way to gauge the closeness of relationship? Runs of Homozygosity - Are your parents related?